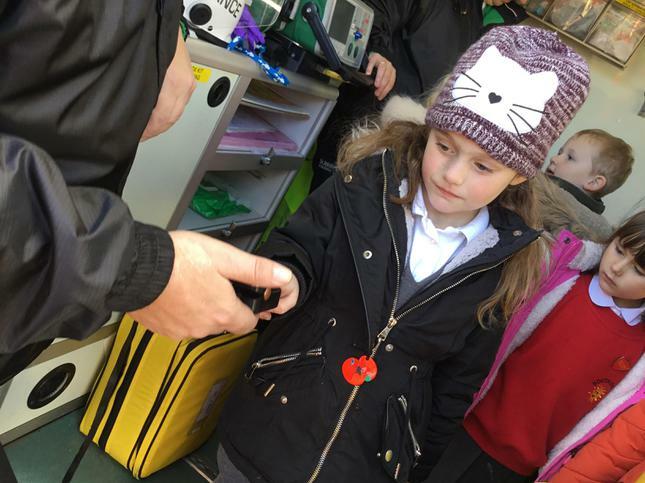 Thank you for taking the time to visit our page. 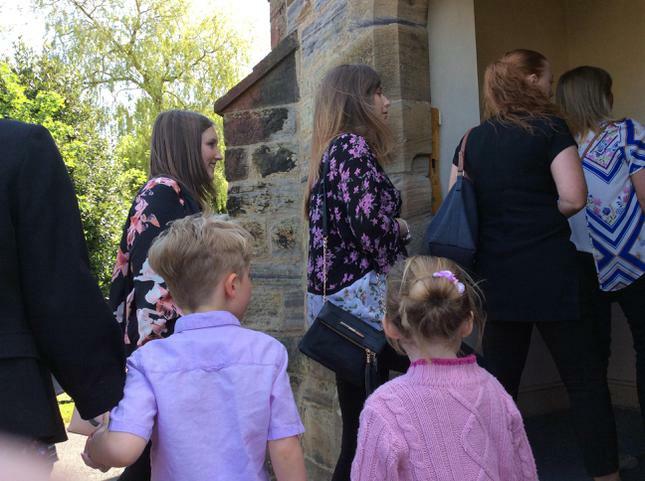 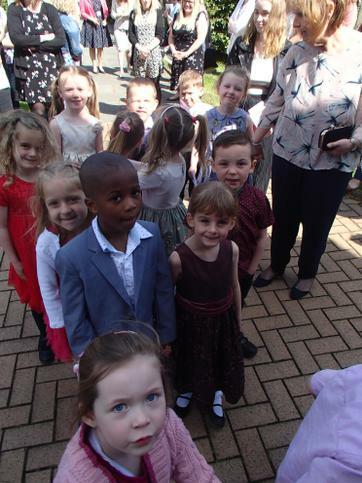 Whether you are already a Reception parent or someone who is thinking of joining us in the future, welcome from the Reception team. 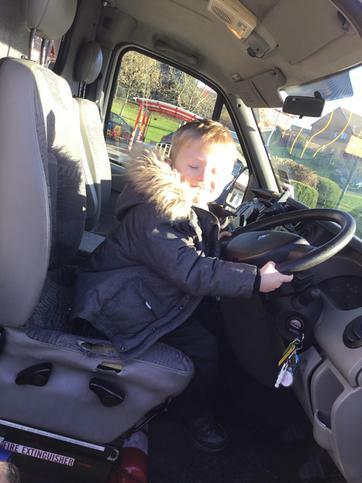 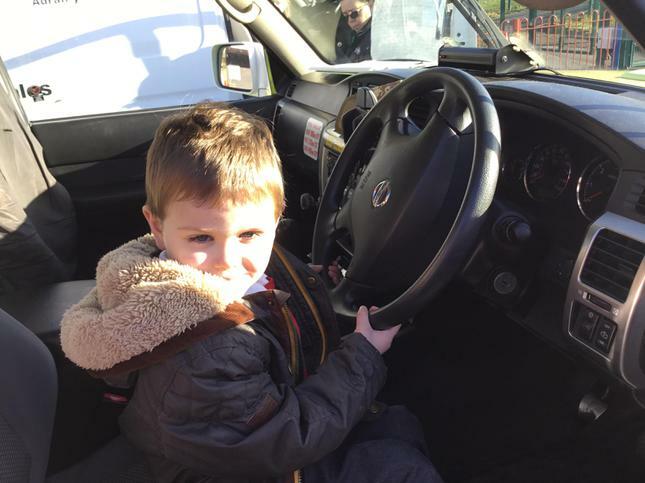 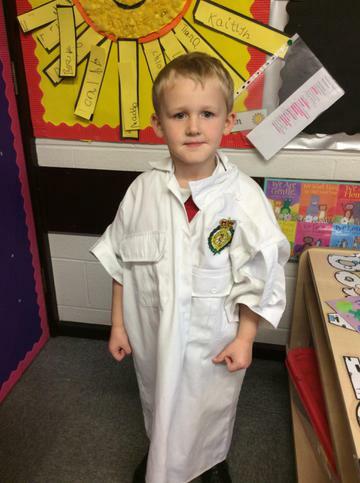 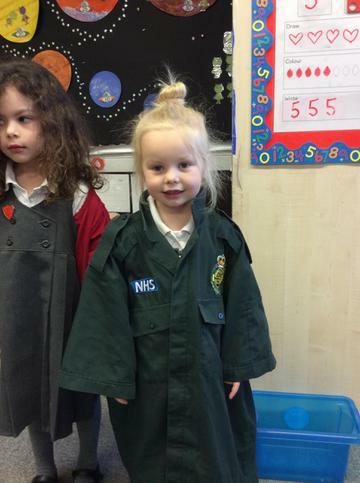 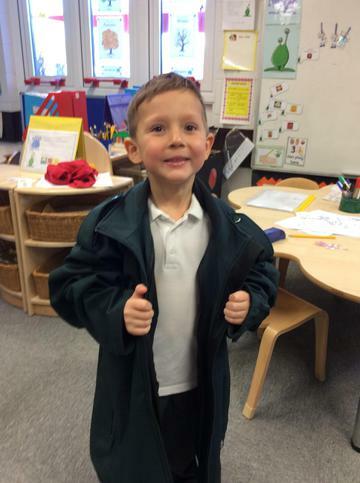 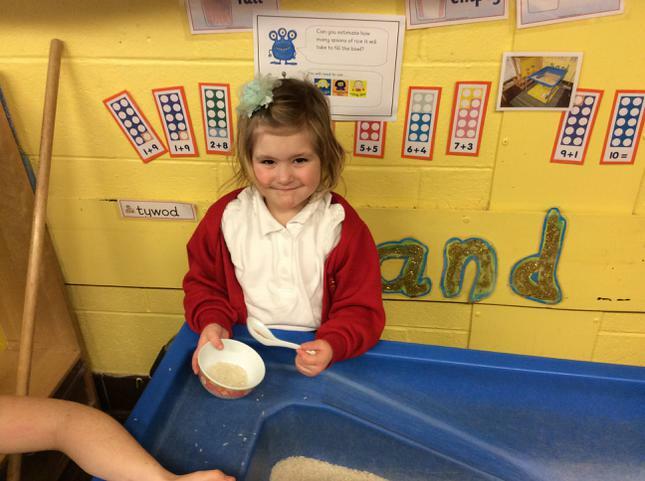 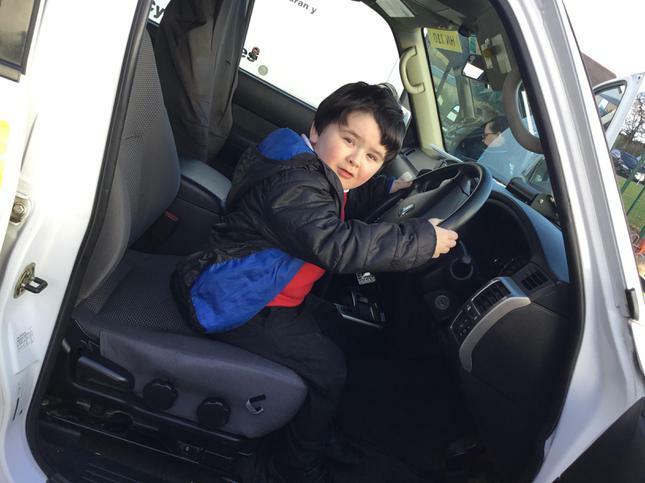 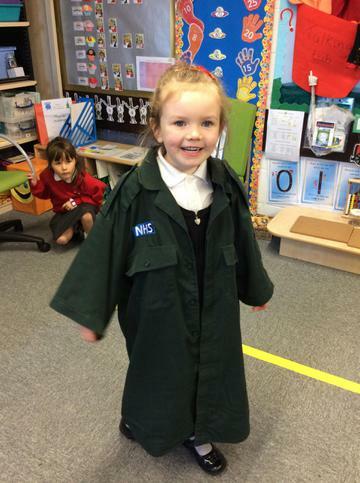 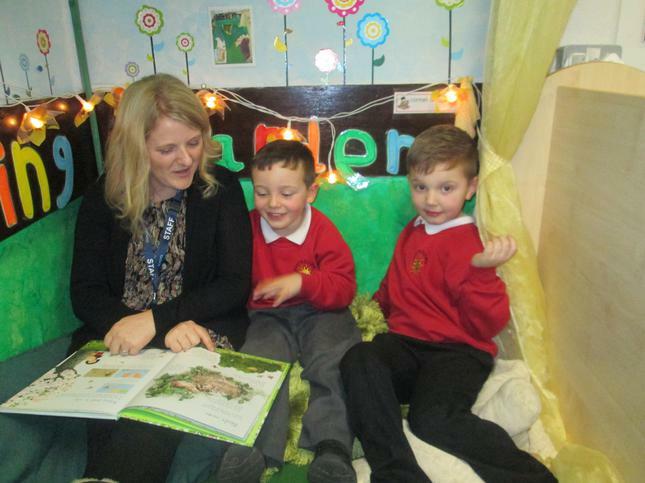 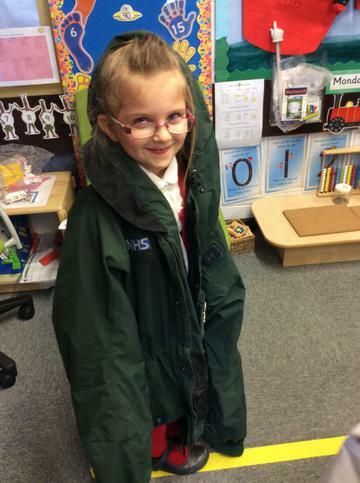 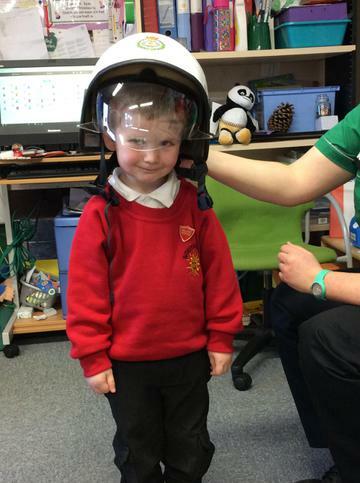 We are delighted to welcome you and your child to Reception. 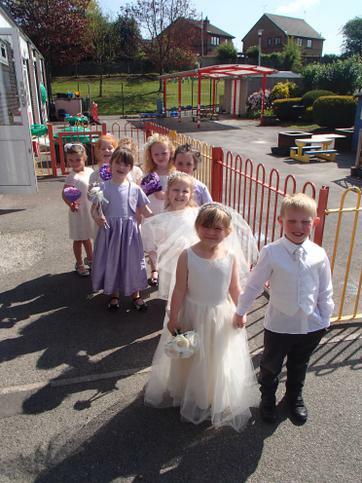 We hope that their time with us is a happy one. 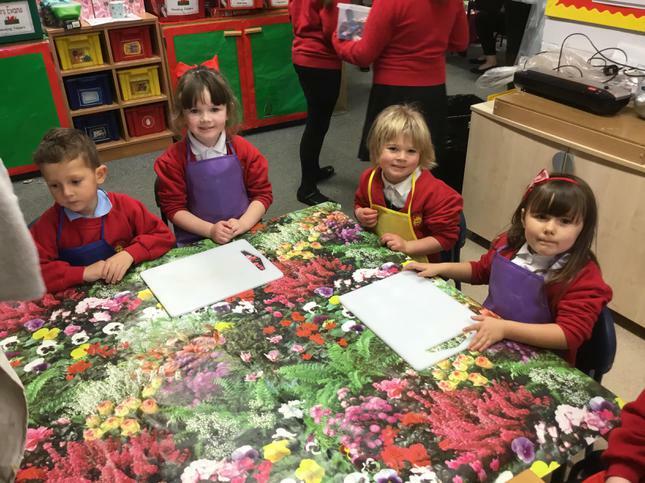 Our first priority is to make all children feel happy and secure in school so that they can become successful learners. 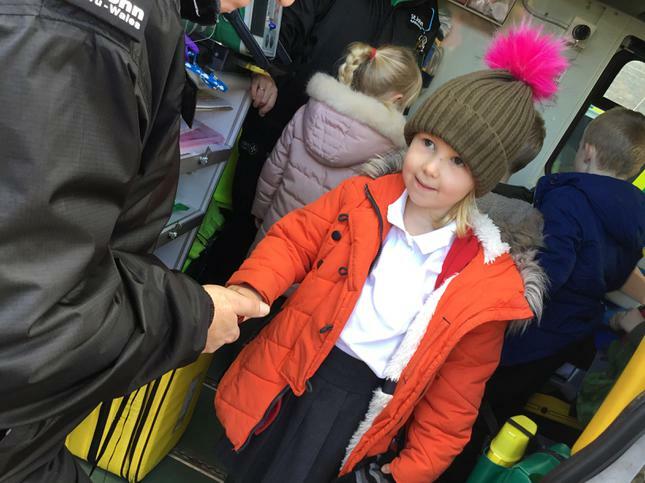 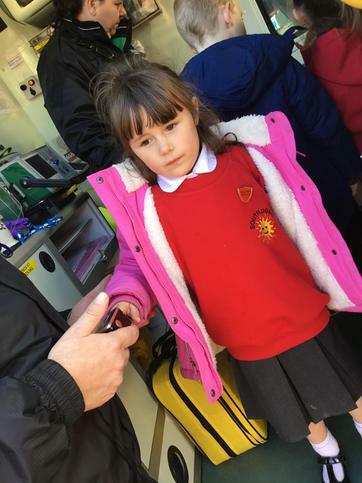 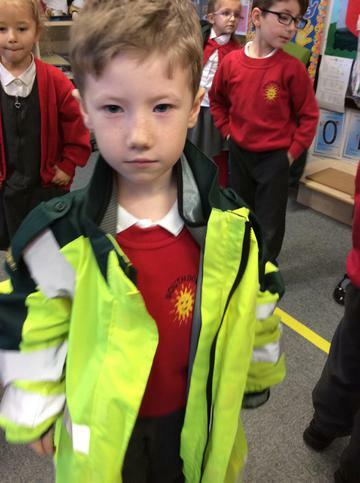 We ensure each child is greeted as they come into school each morning. 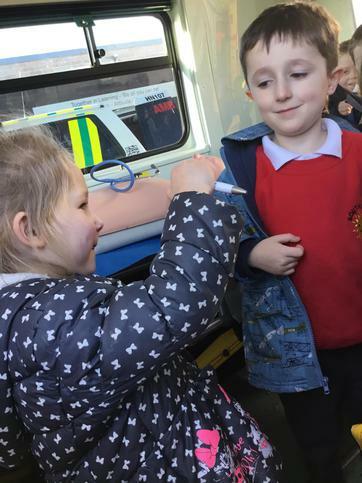 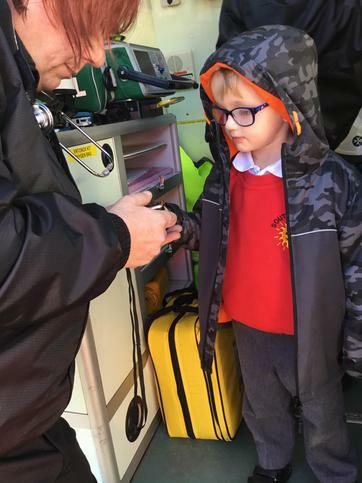 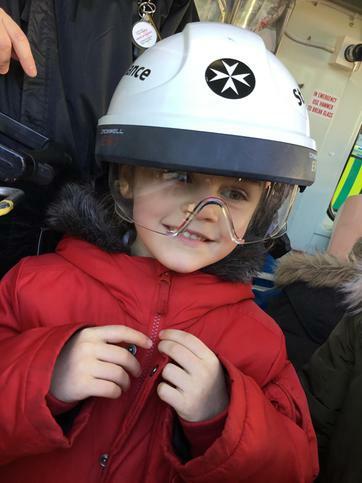 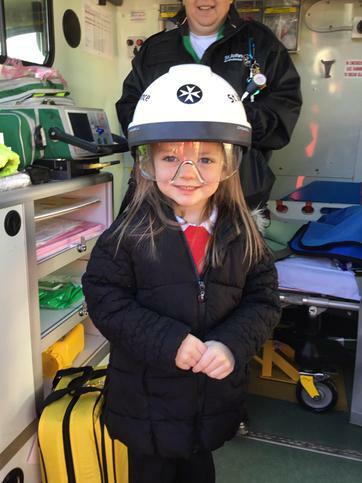 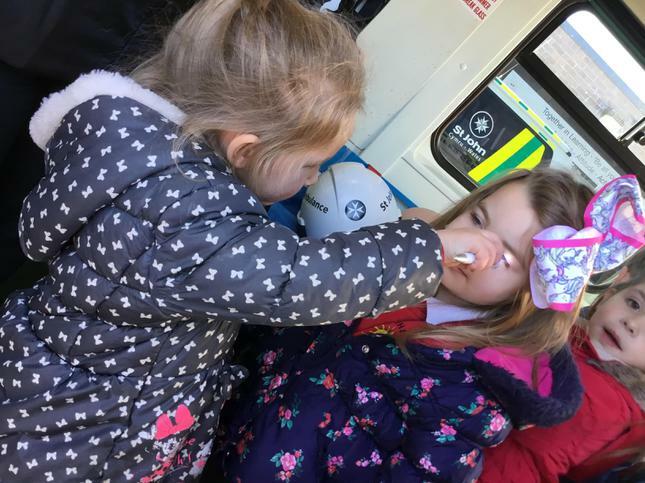 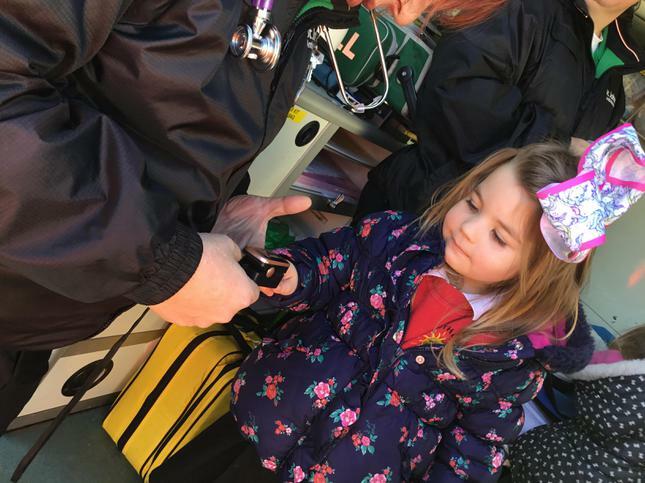 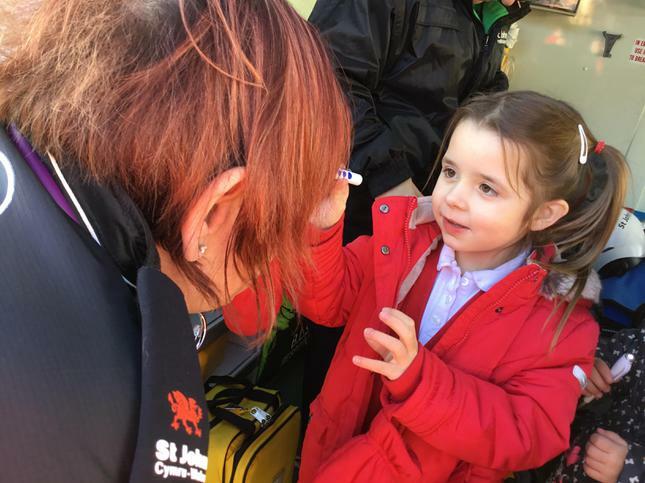 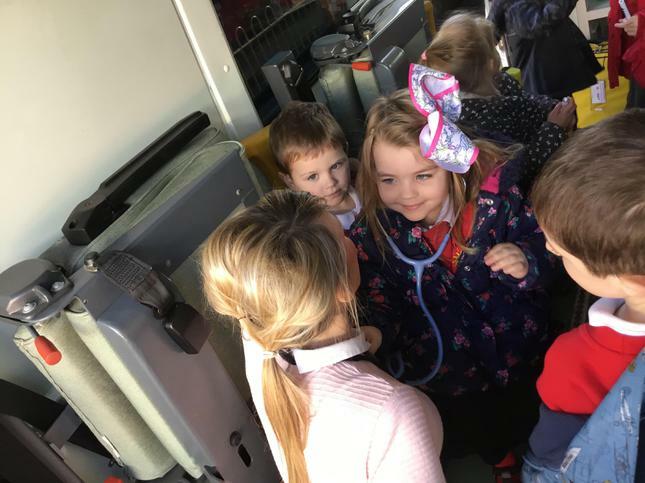 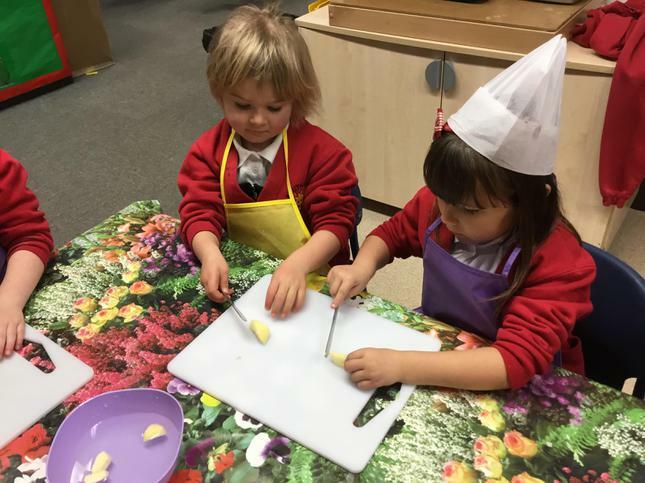 Every child is an individual and they will each be given opportunities and support to develop their skills and interests at their own stage. 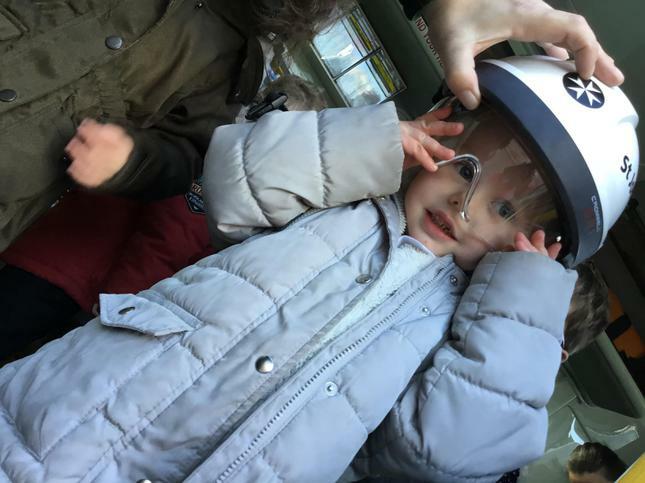 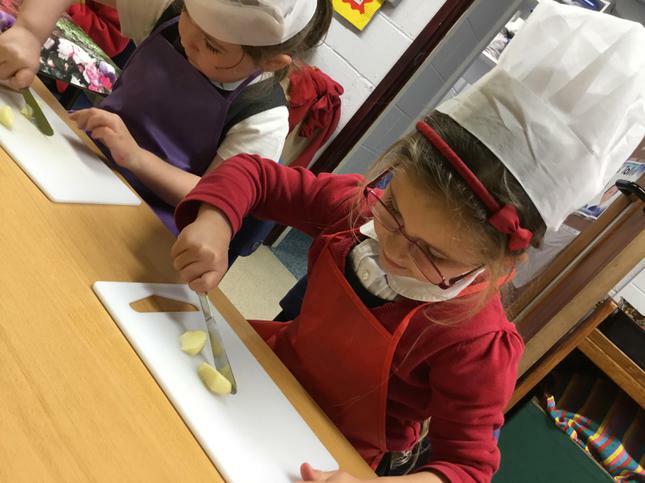 We work hard to foster curiosity, determination and a love of learning which will provide a firm foundation for their future education. 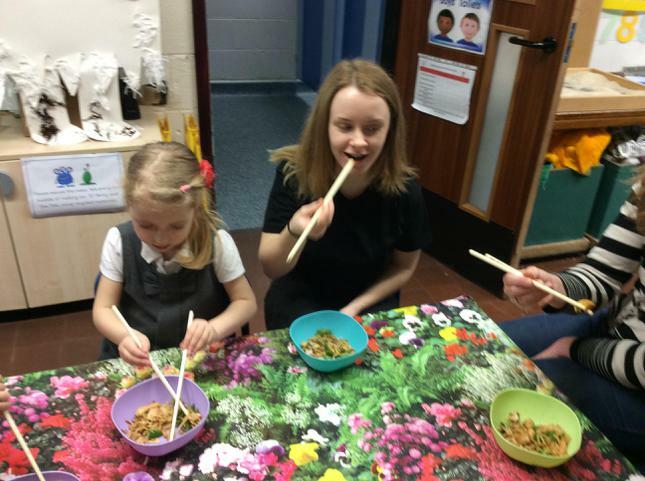 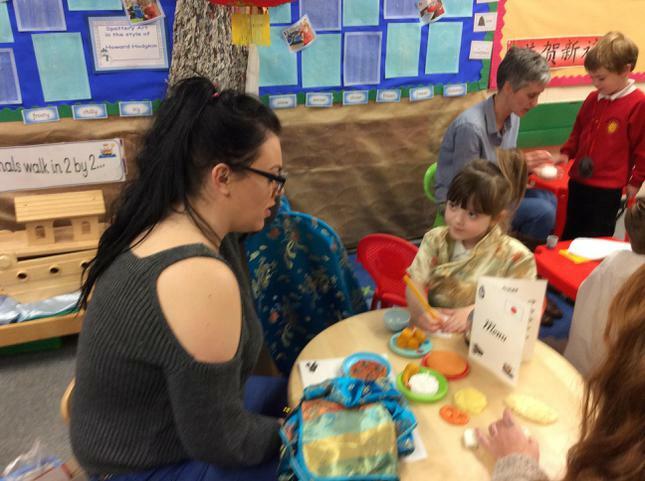 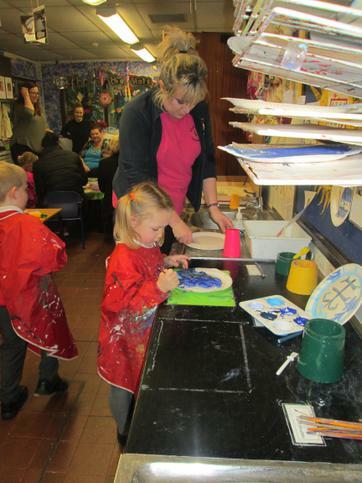 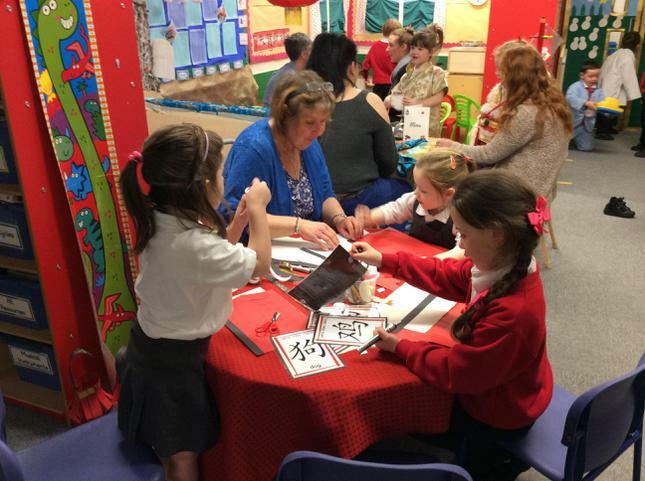 Parents are very welcome in our school. 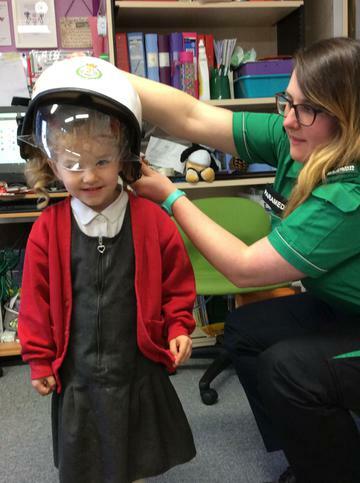 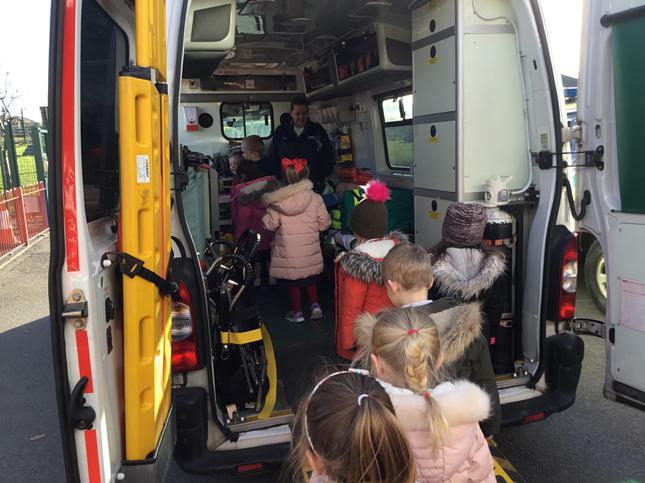 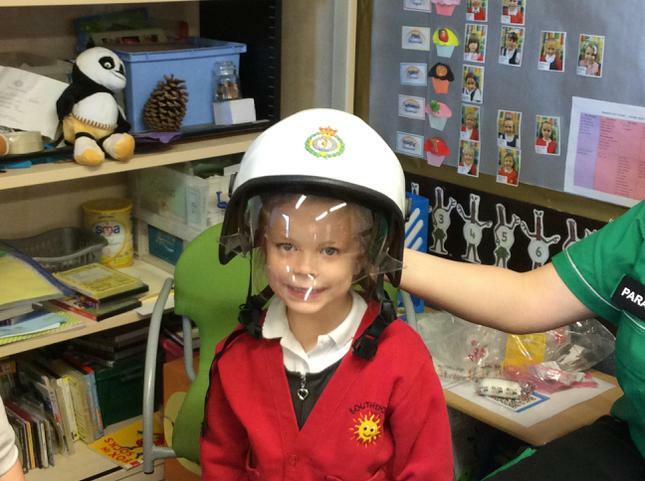 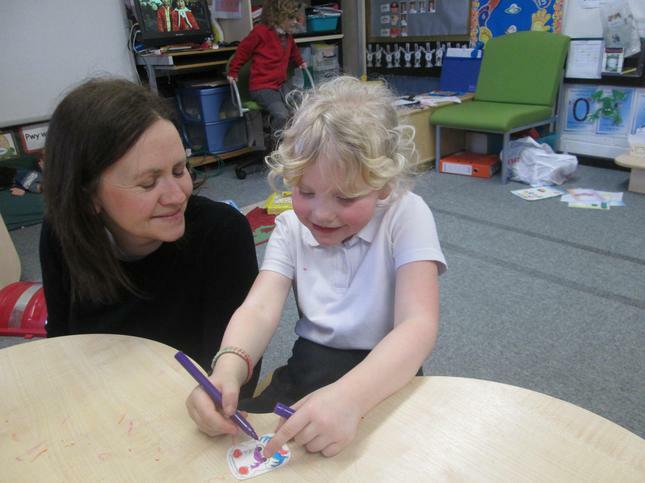 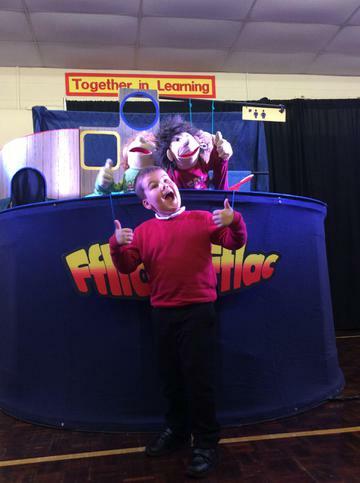 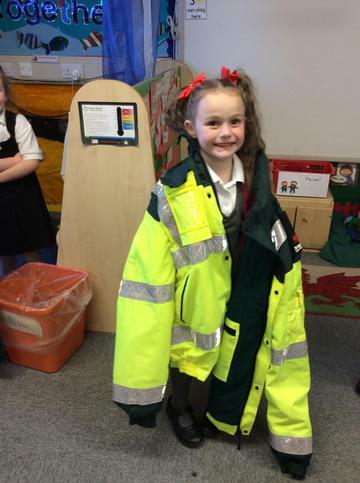 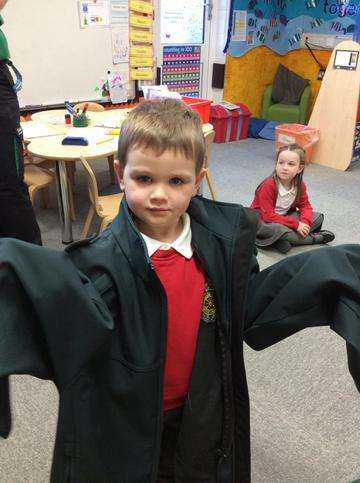 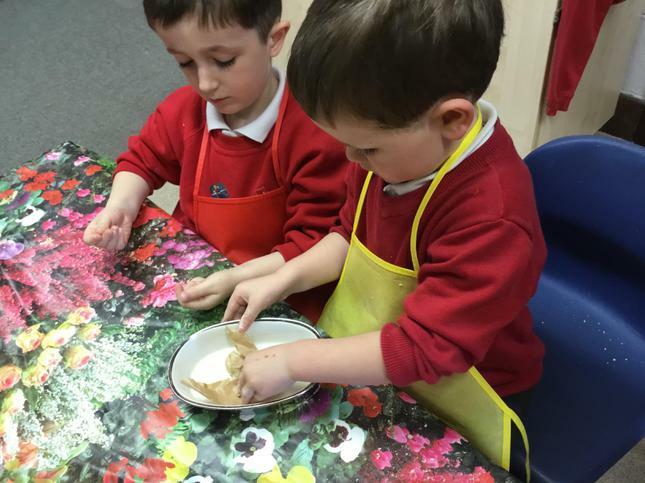 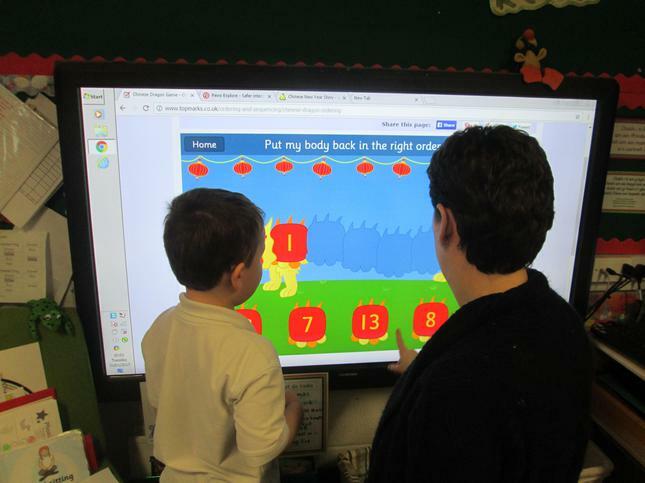 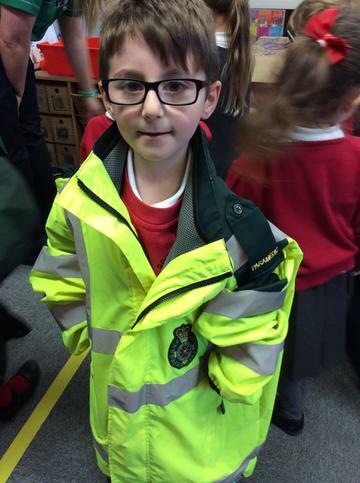 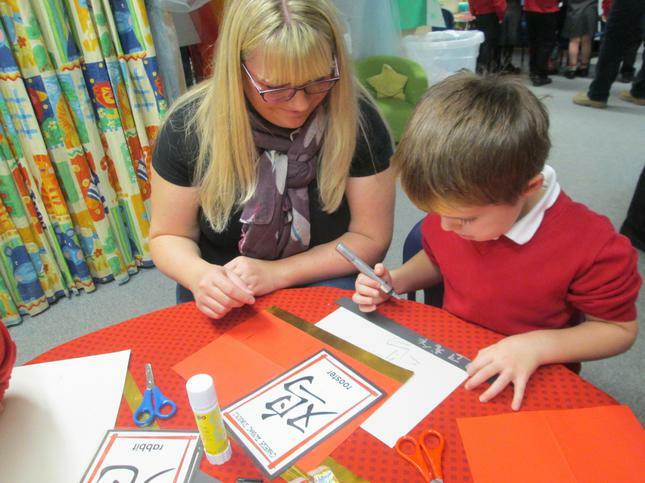 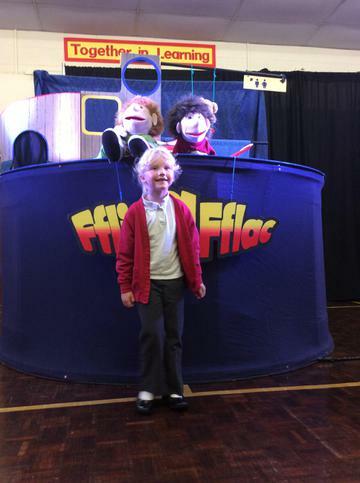 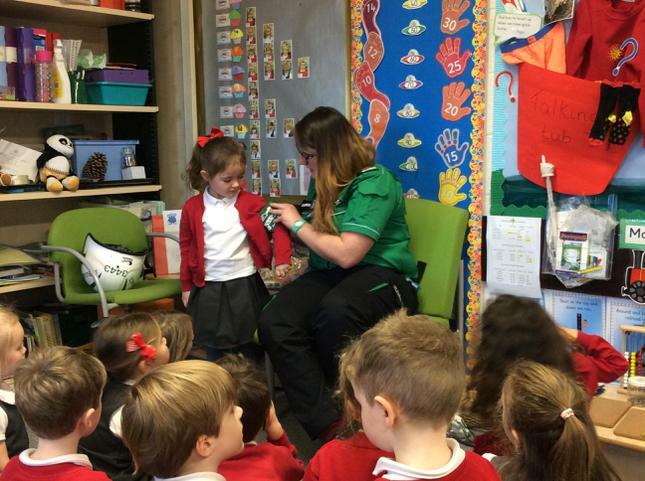 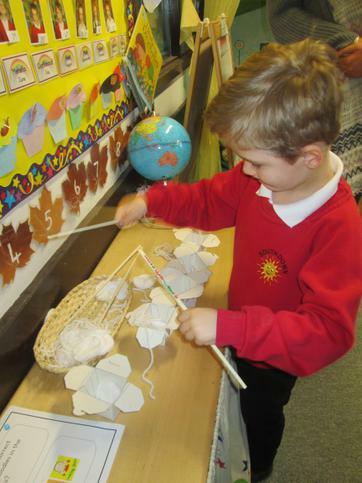 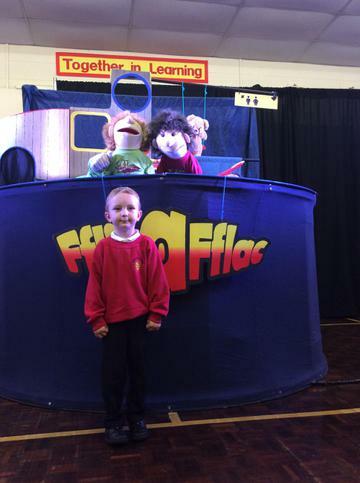 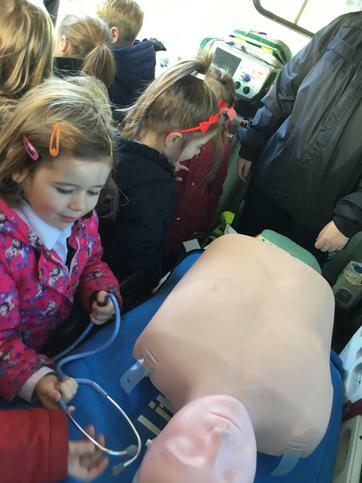 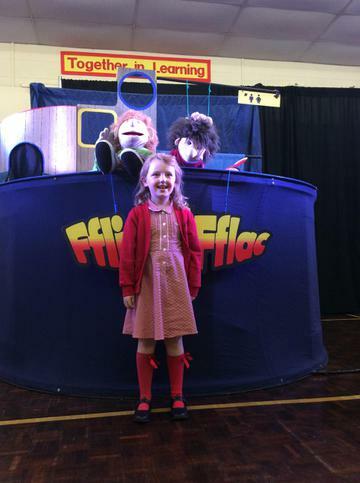 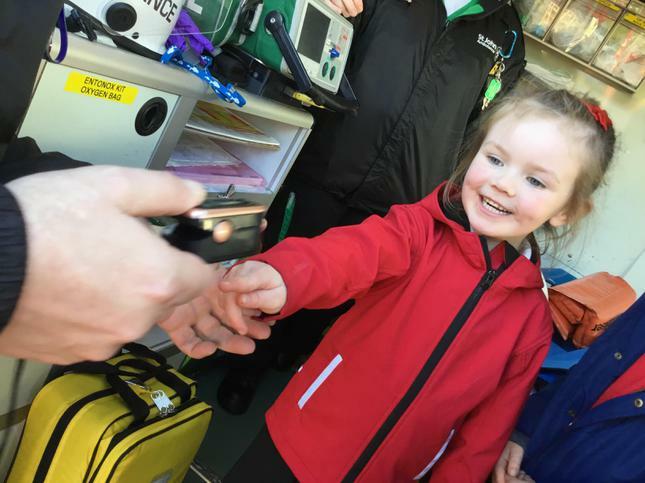 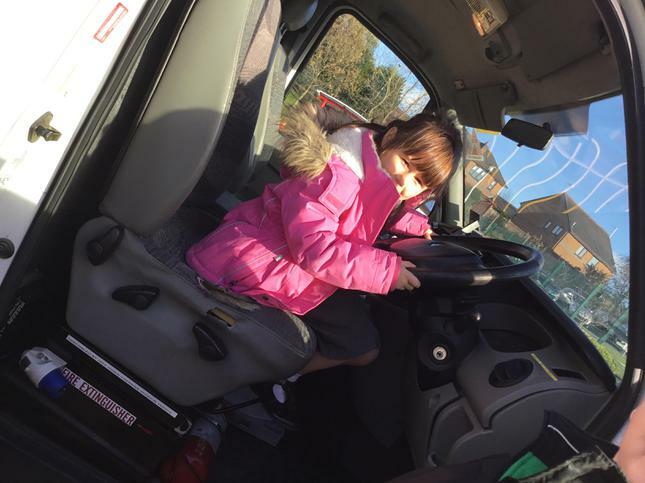 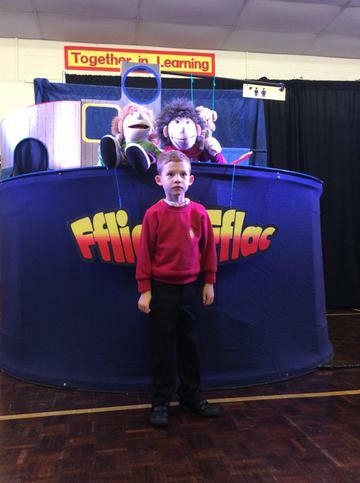 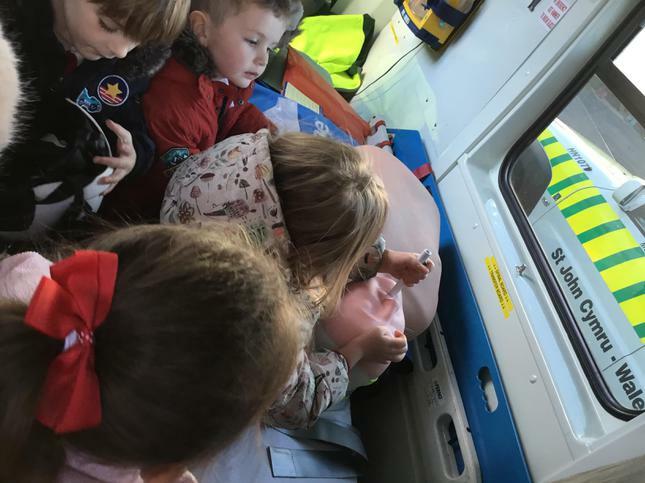 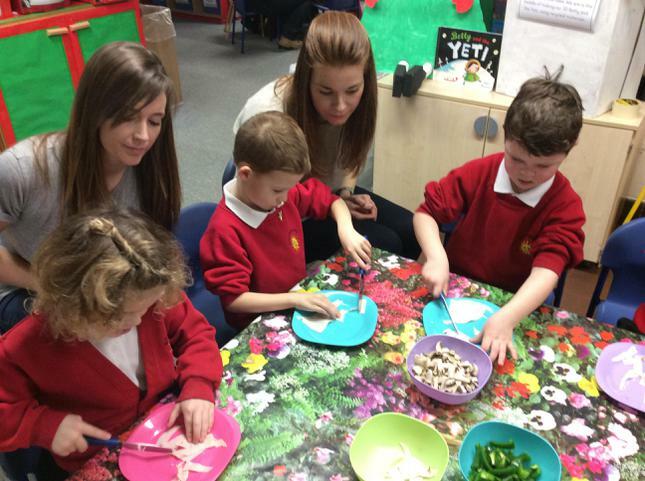 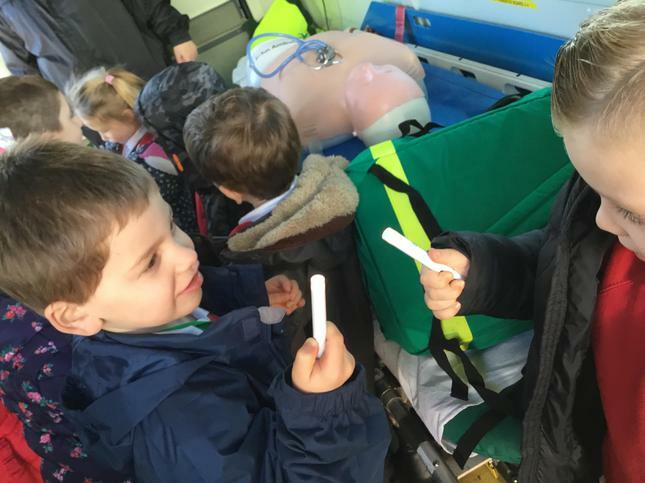 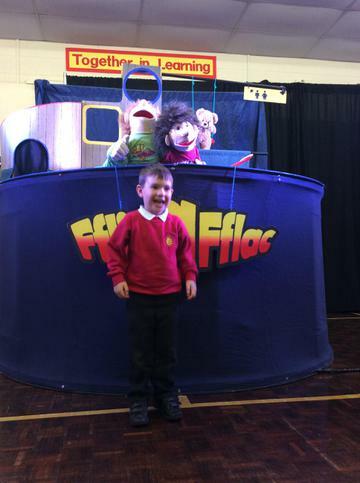 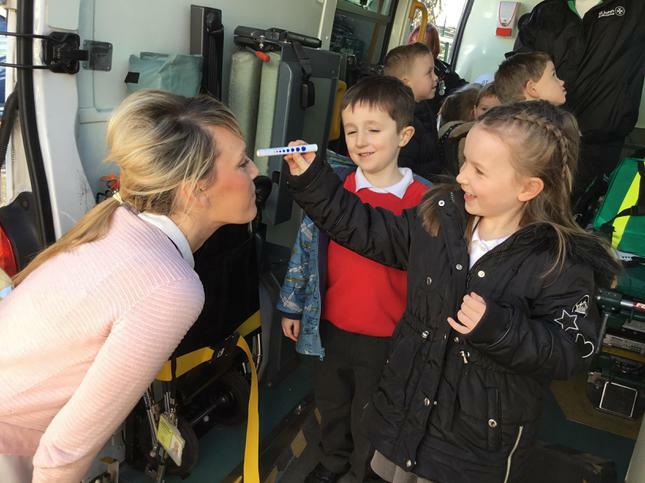 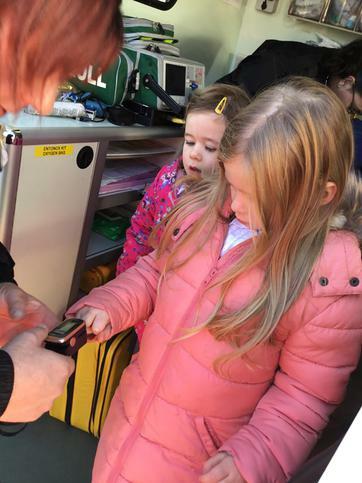 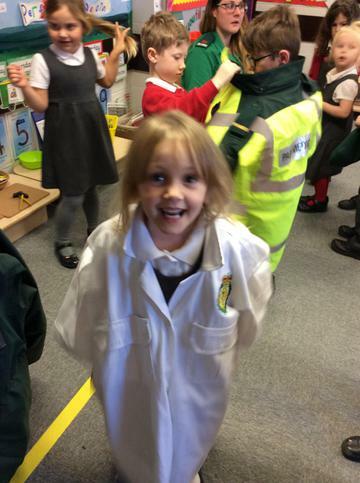 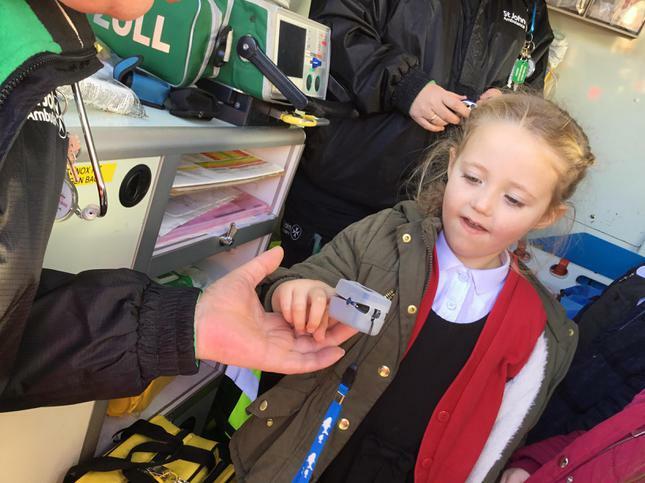 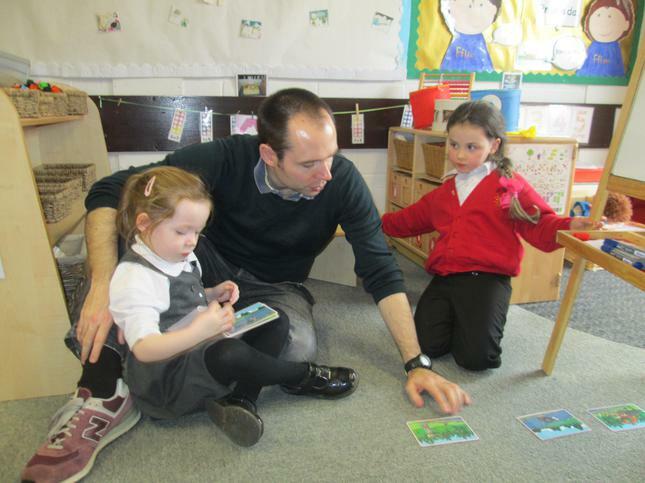 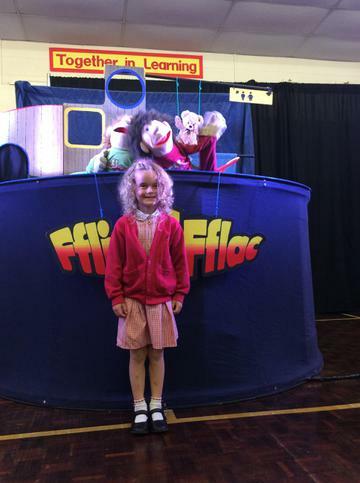 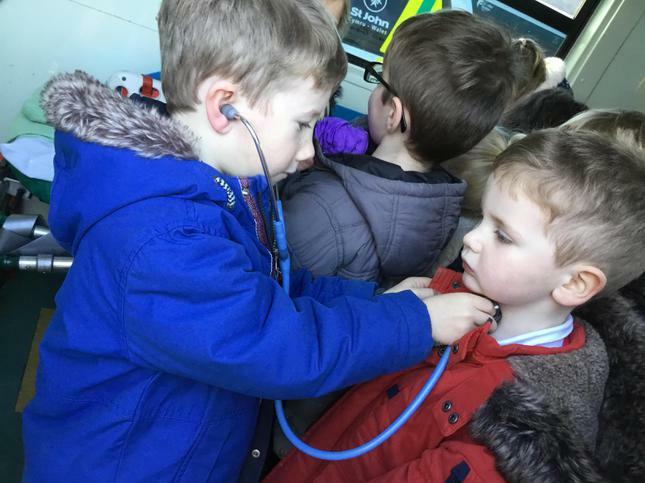 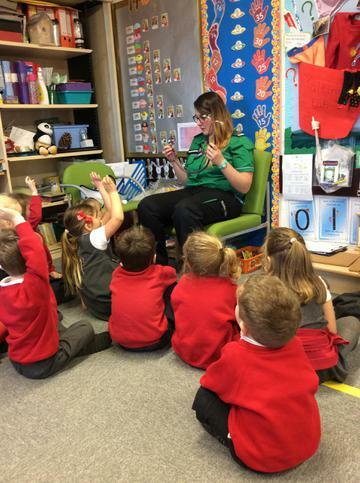 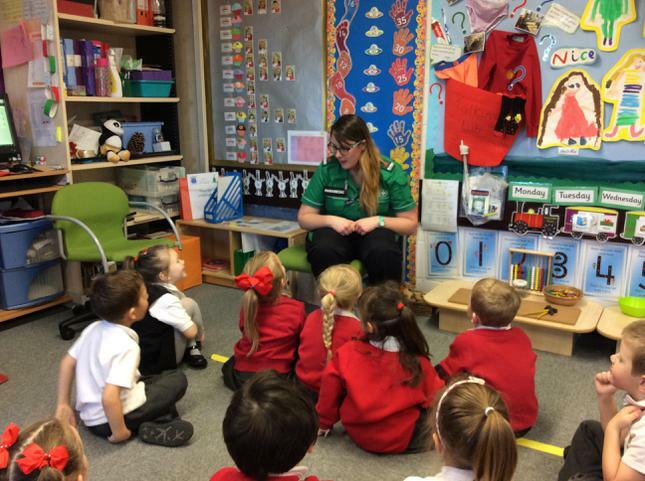 We value the skills and knowledge that you have and like to use these to enhance the children’s learning. 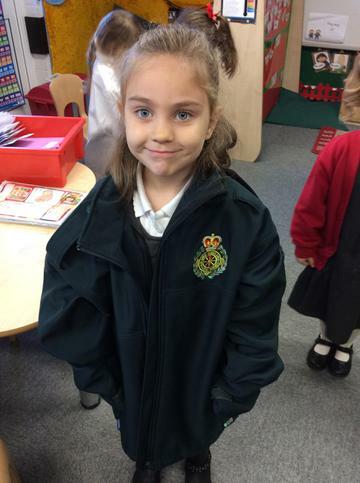 So, if you have a skill that you think you may be able to share or have time that you can spare, please speak to us. 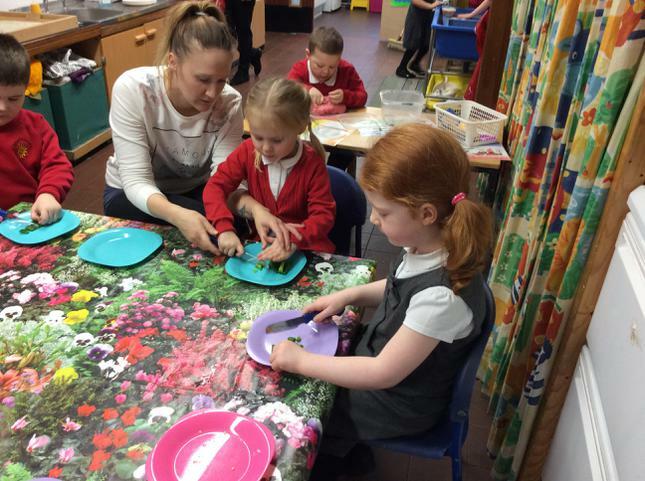 Extra pairs of hands are always welcome! 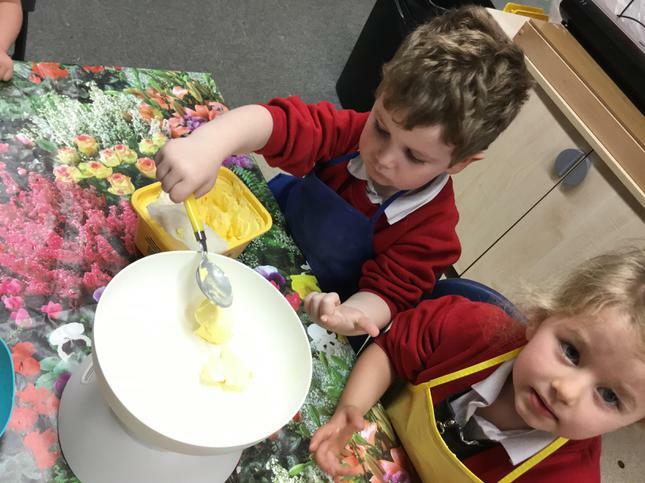 Each term we write a Newsletter. 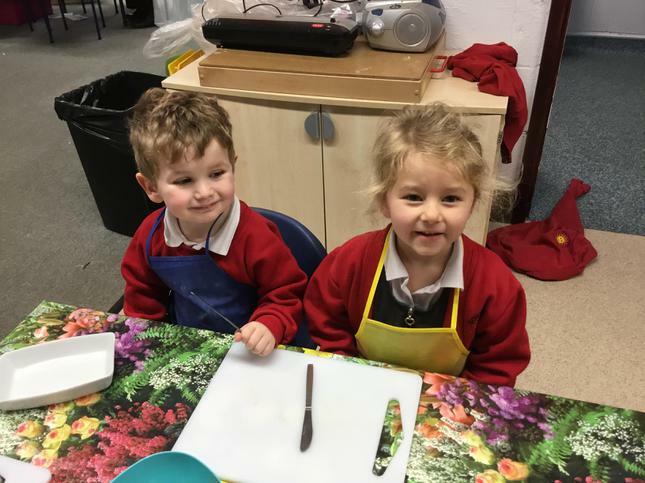 Please take a look at all the exciting things we are doing! 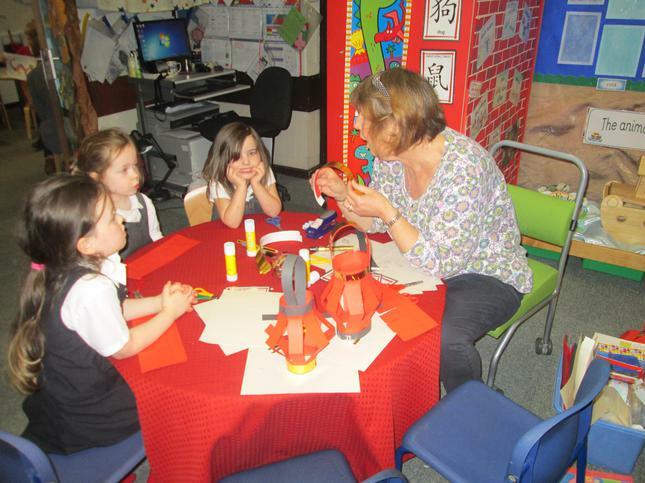 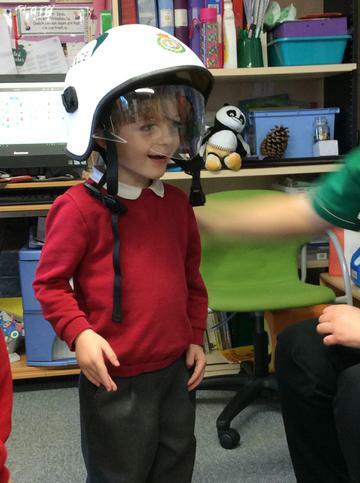 One of our topics in Reception is Celebrations. 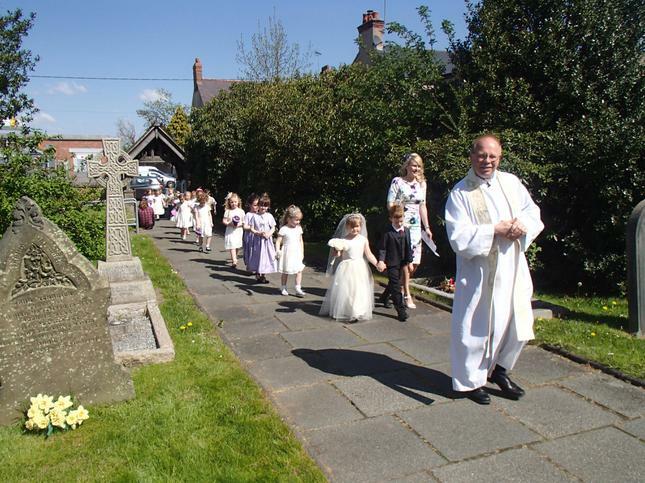 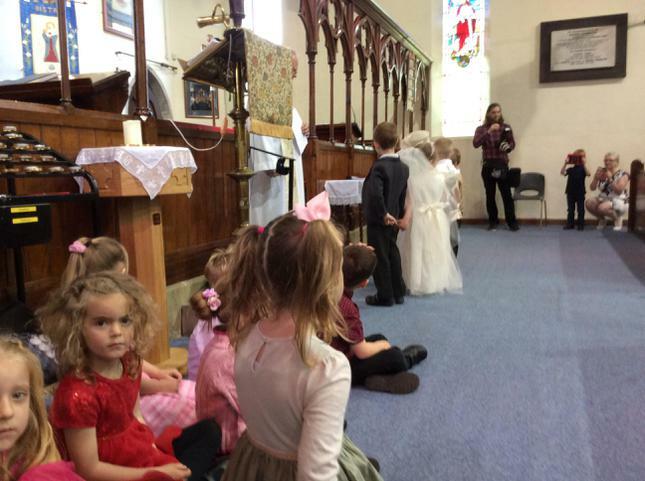 As part of this topic, we looked at a traditional Christian Wedding. 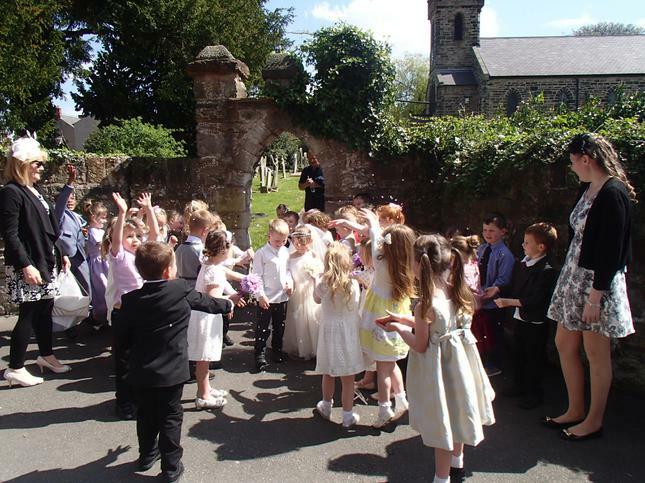 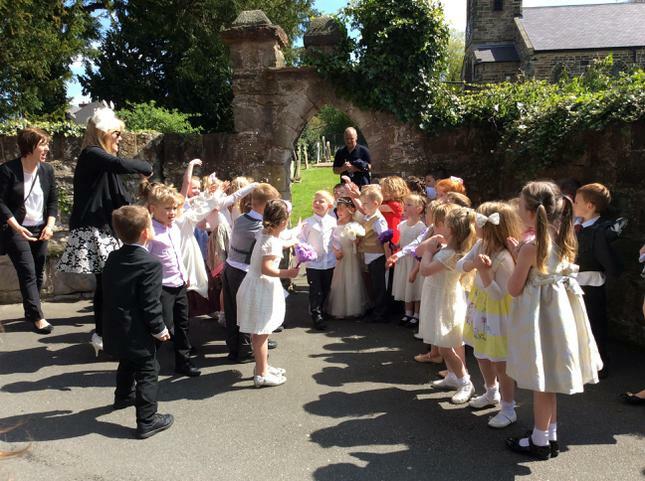 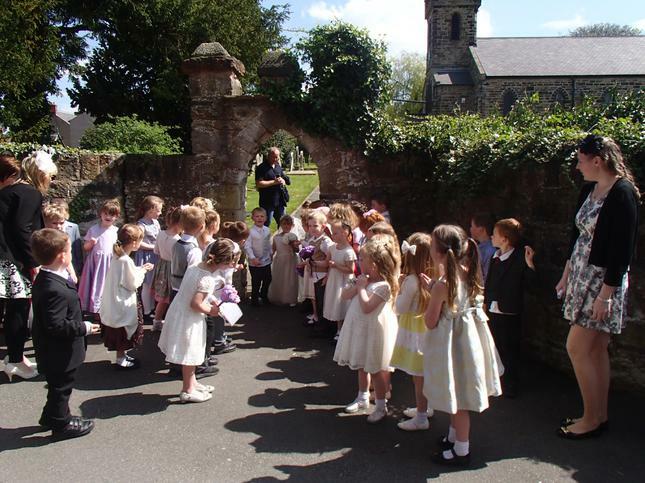 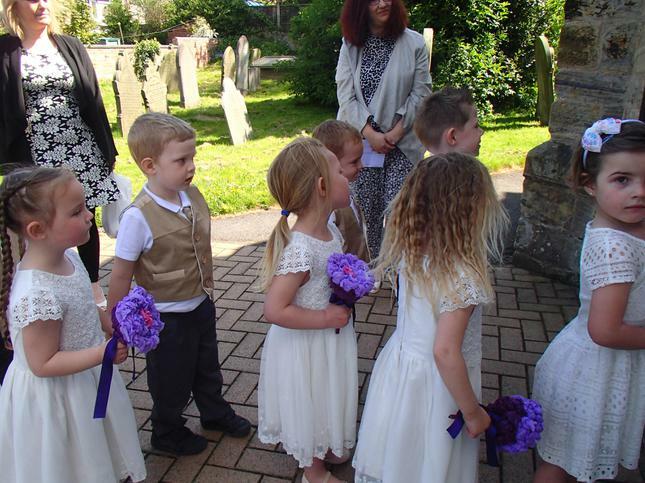 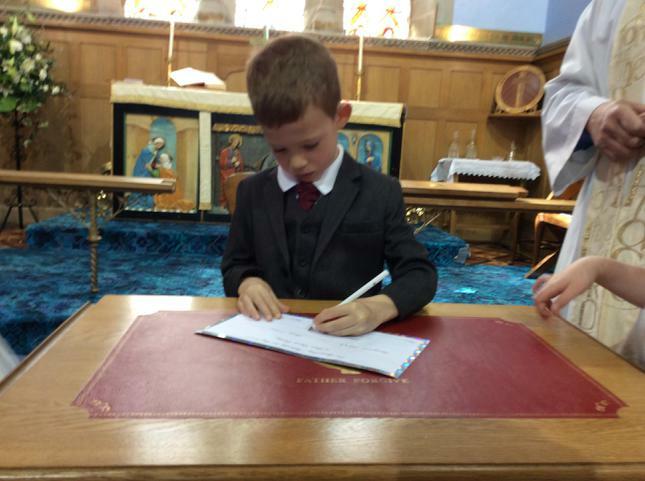 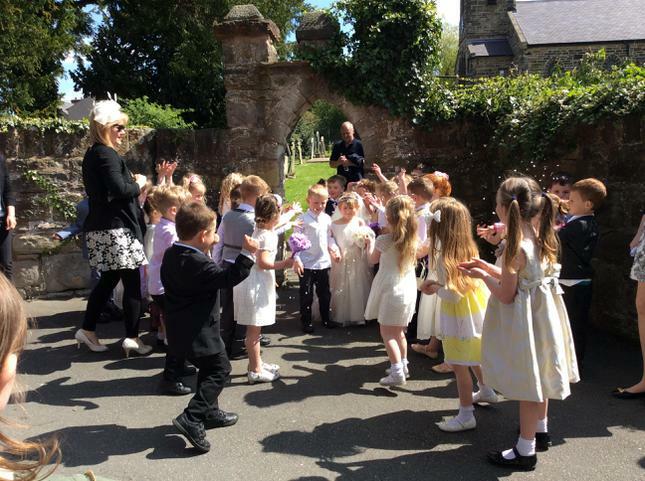 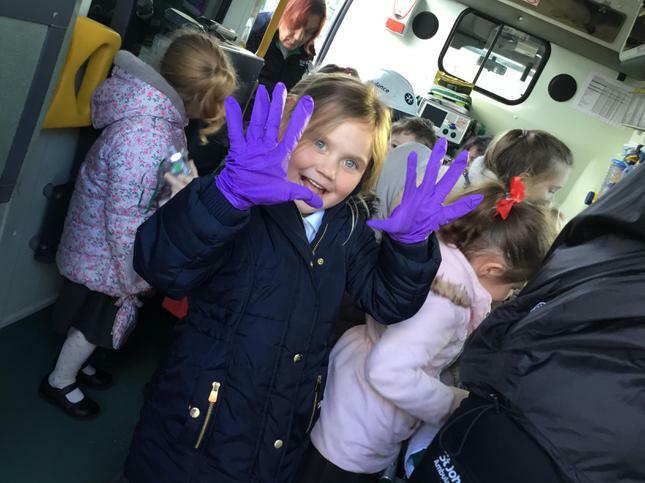 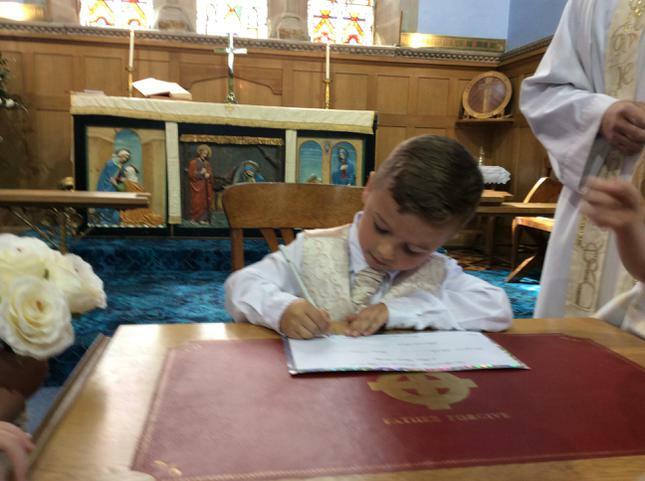 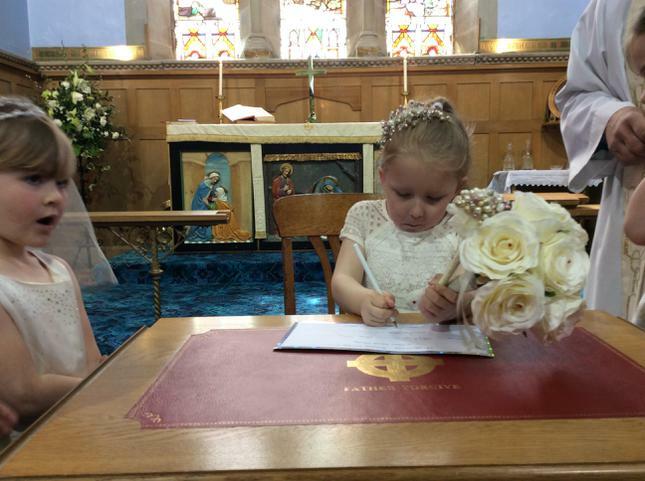 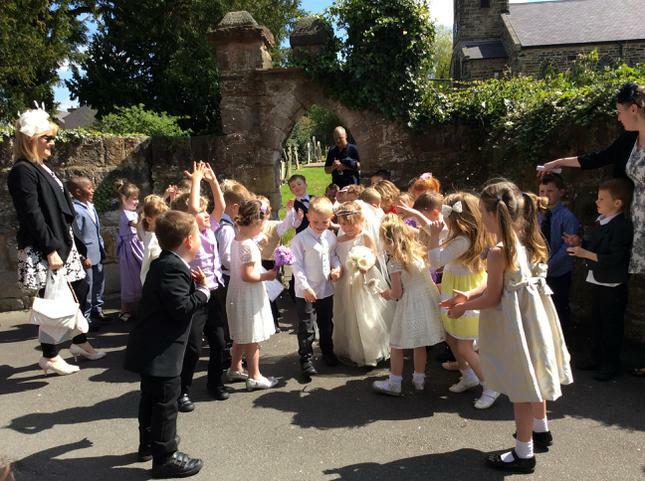 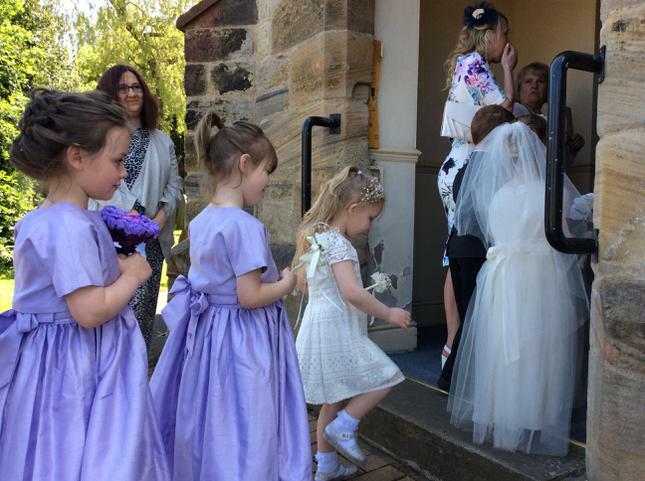 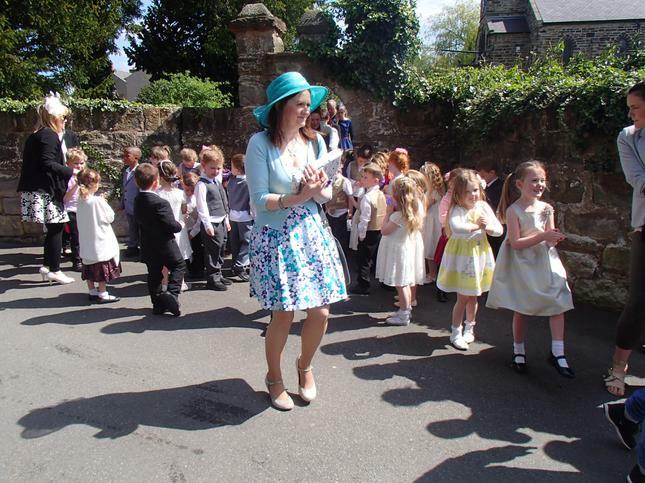 We did lots of research into what happens at a wedding and using our new found knowledge we planned our very own wedding ceremony and celebration. 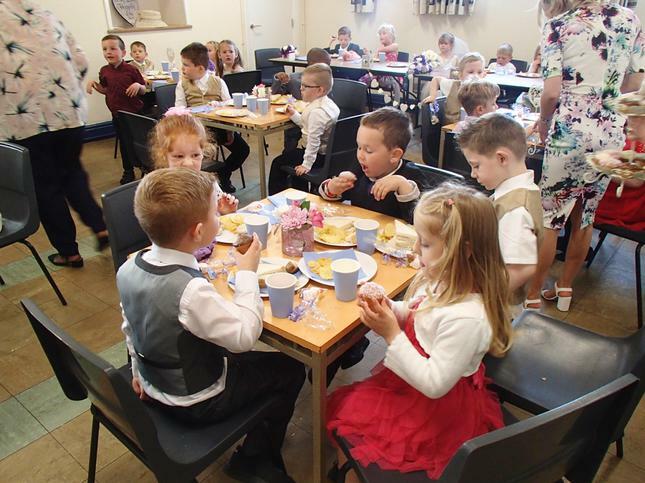 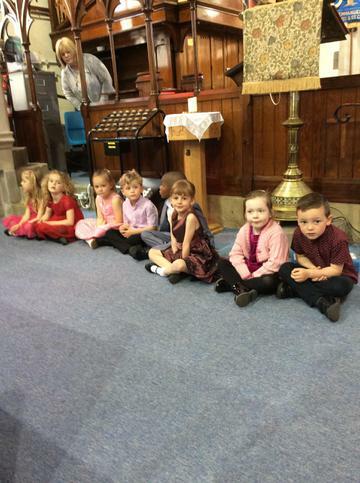 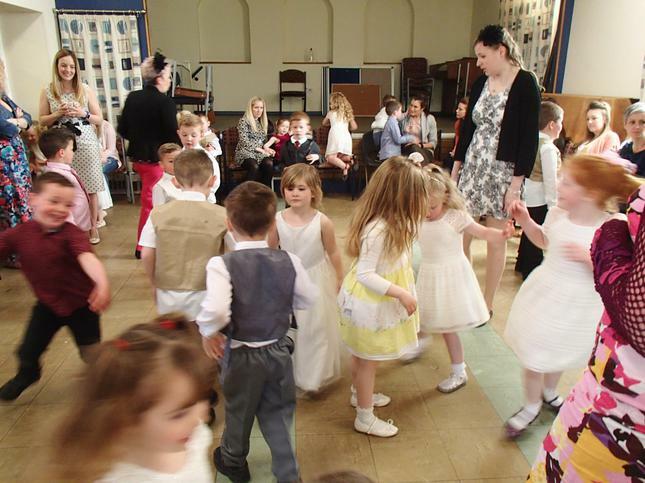 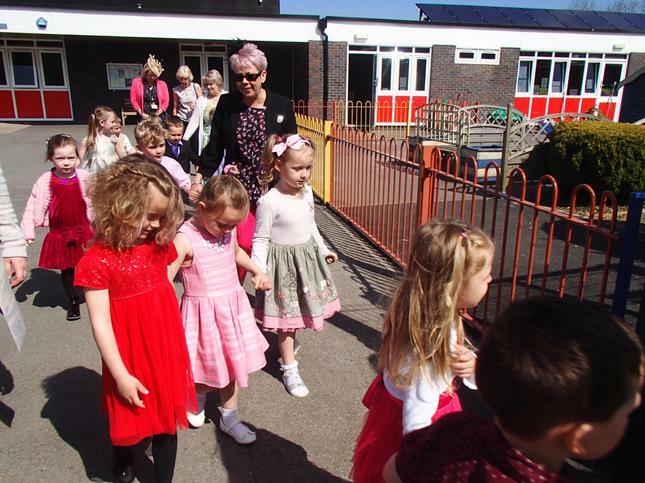 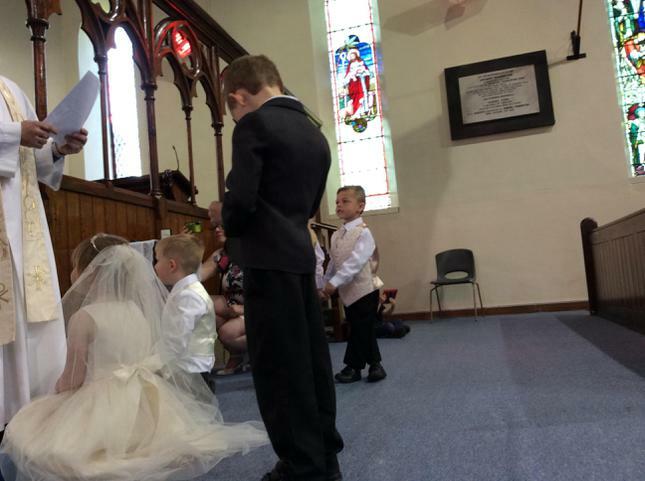 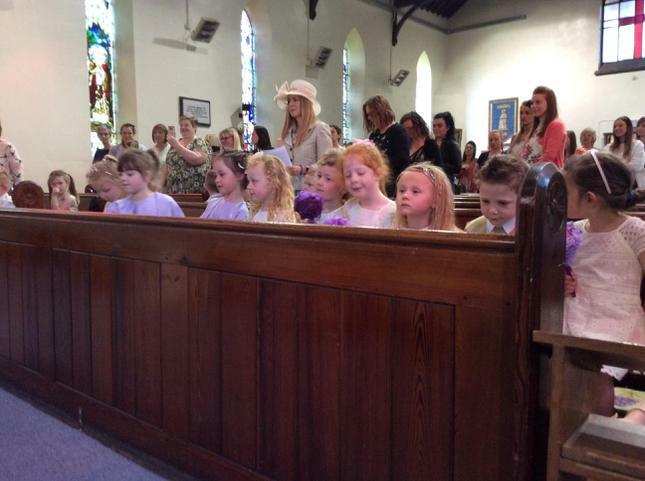 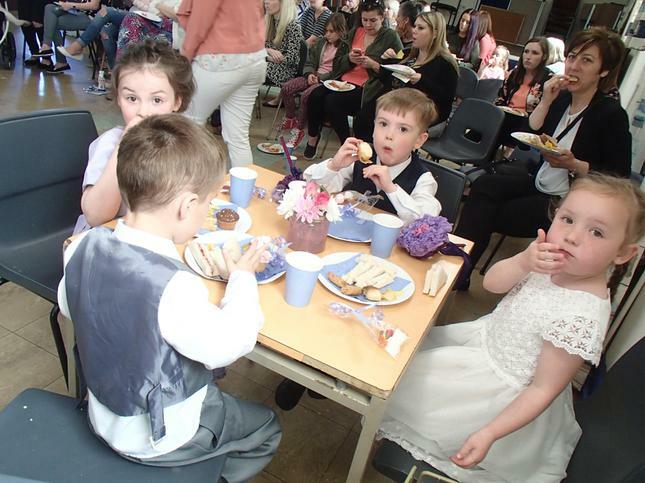 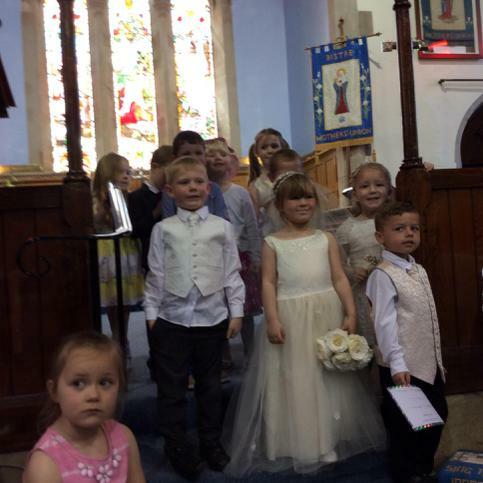 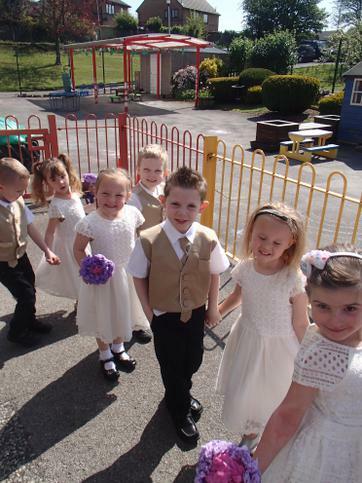 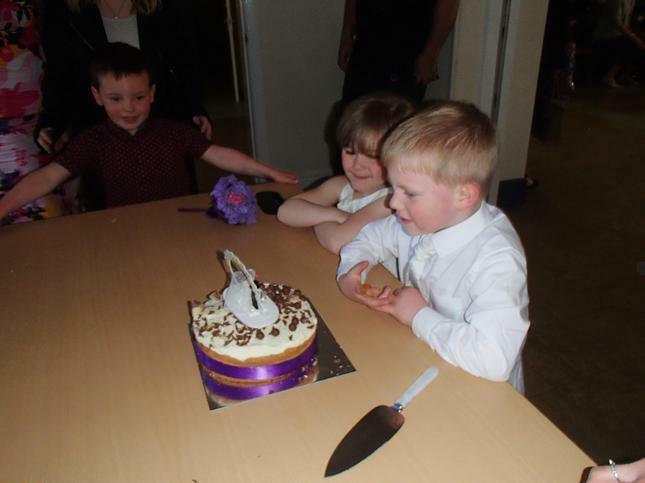 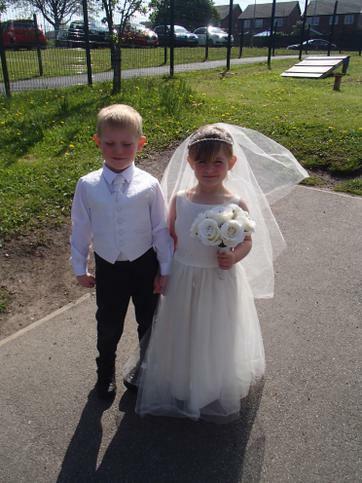 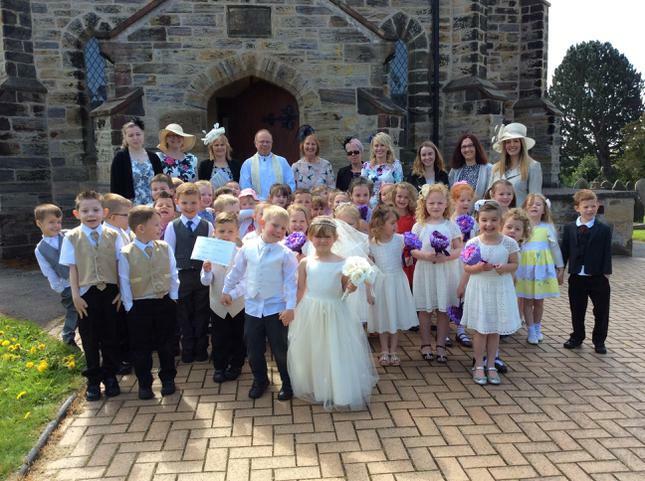 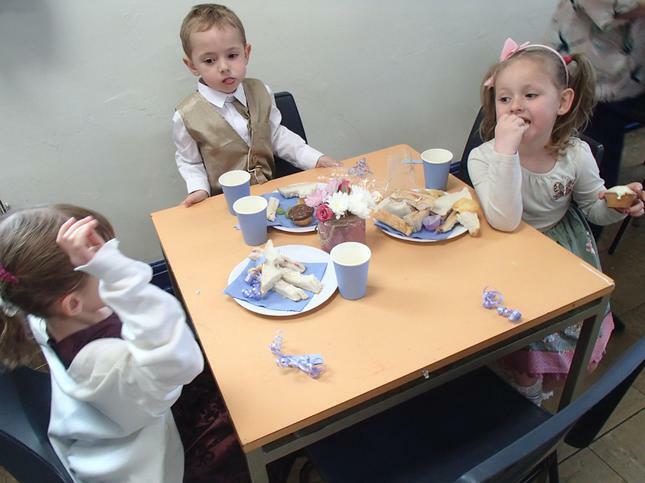 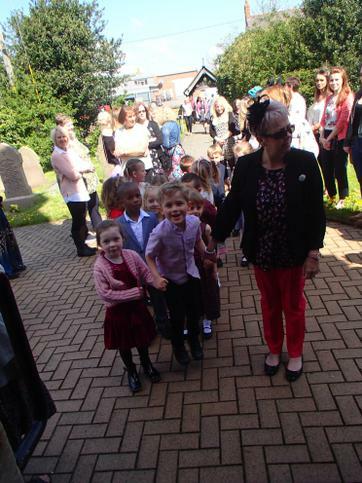 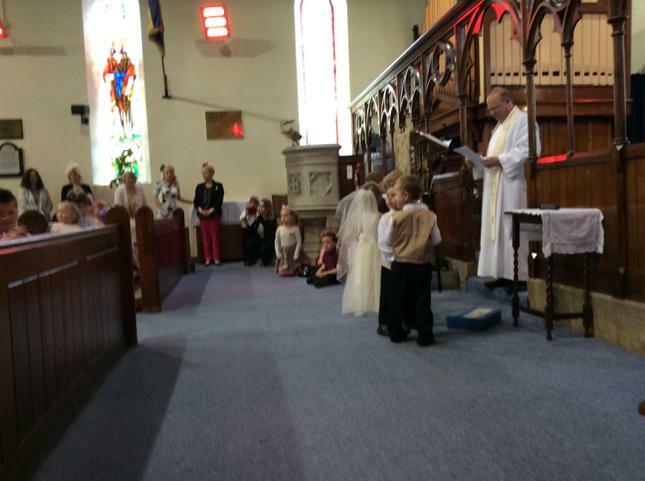 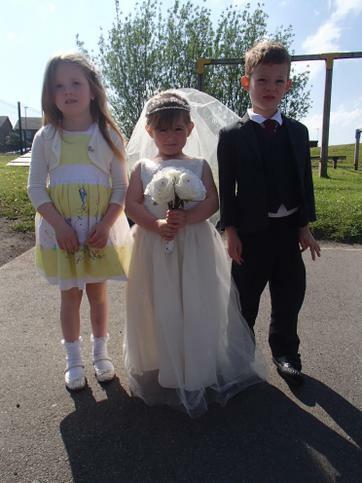 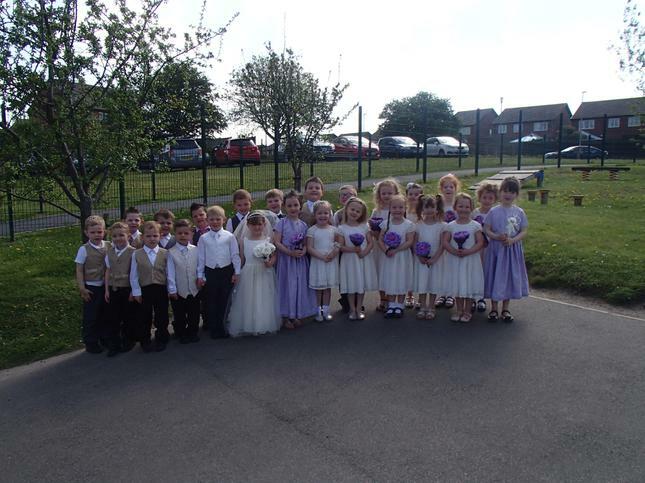 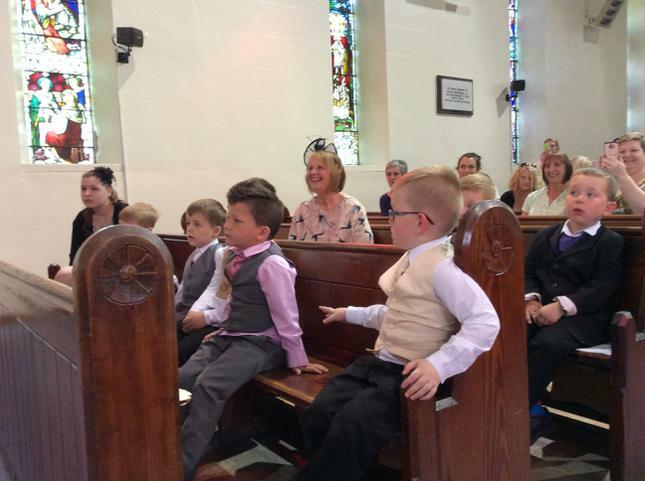 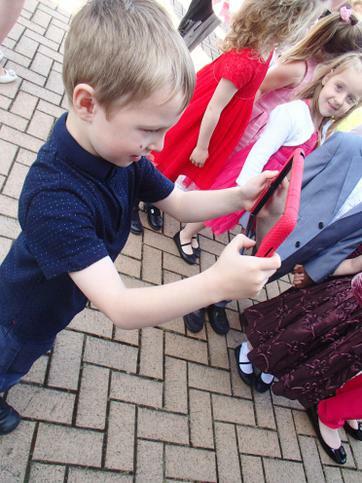 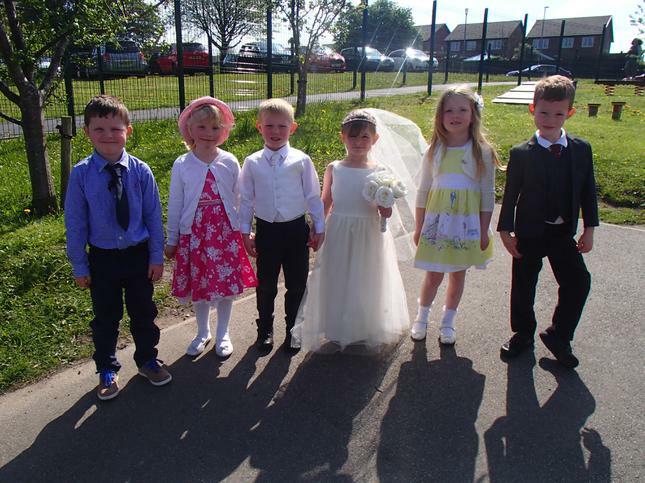 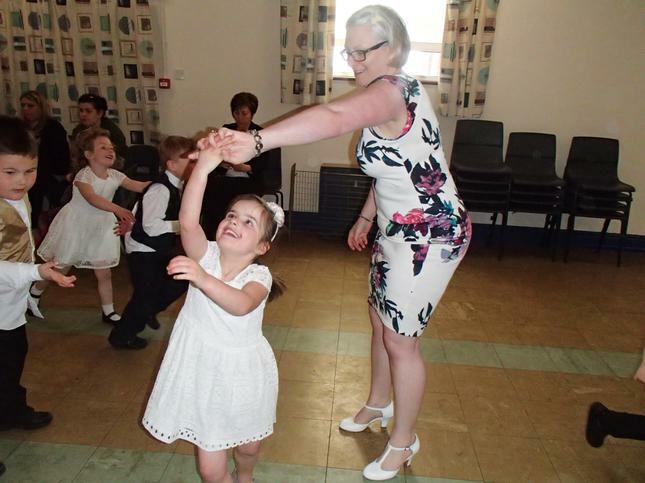 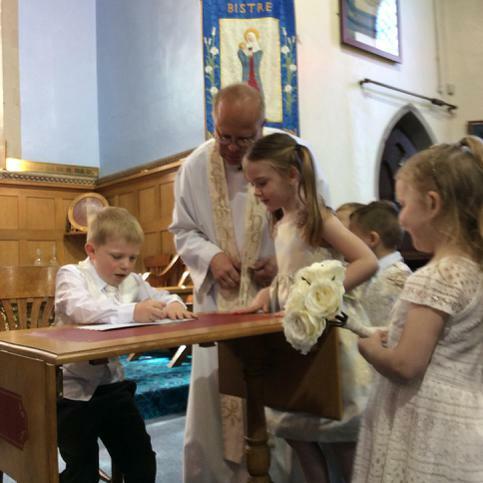 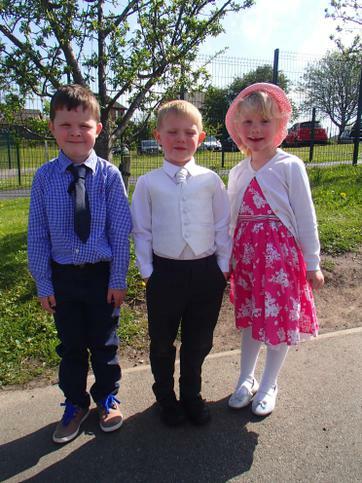 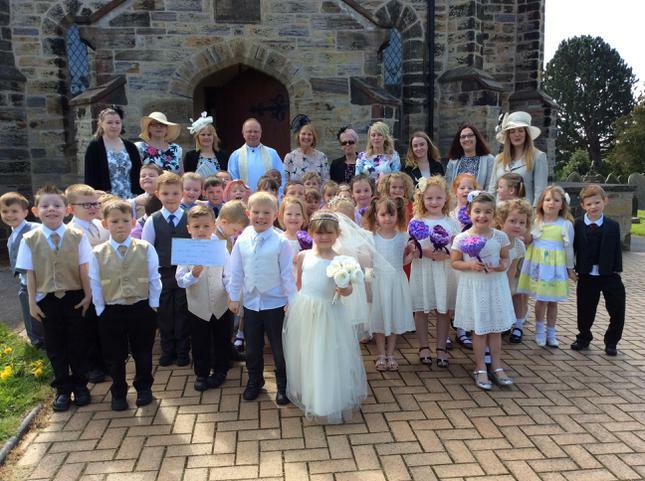 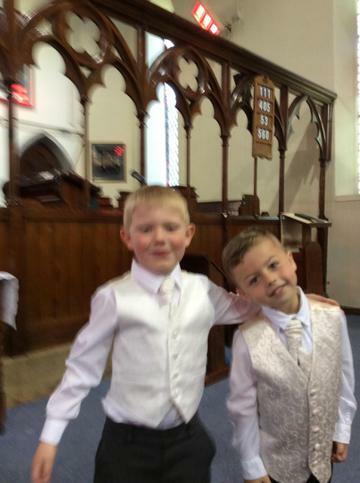 We all had a special part to play in the wedding and we invited our parents along to share in this special occasion. 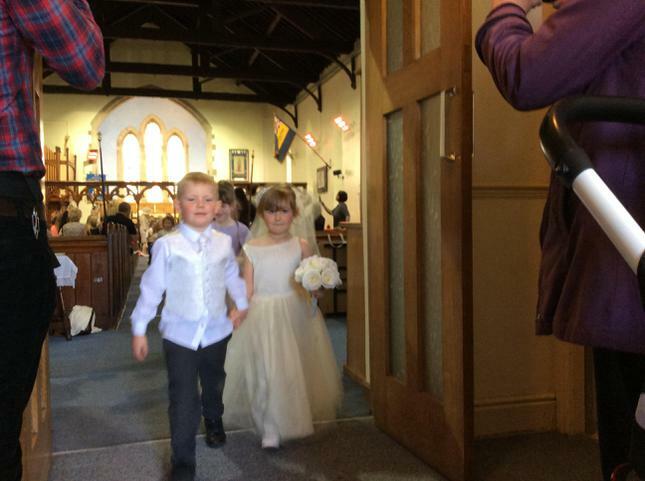 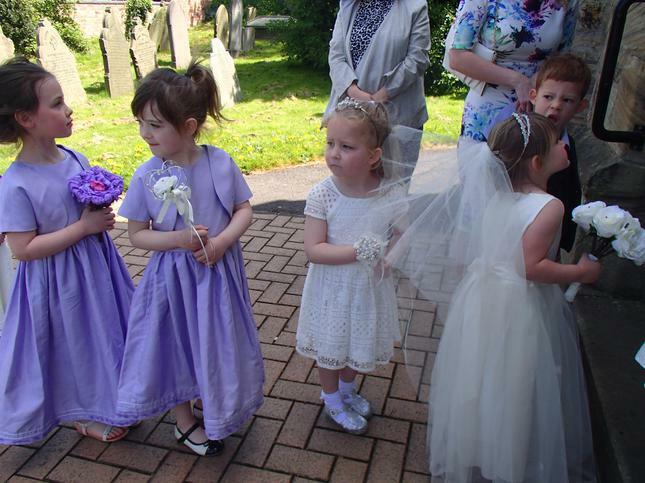 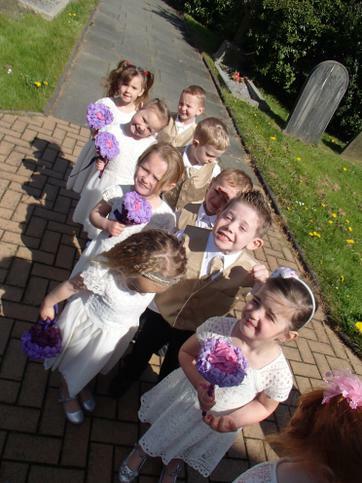 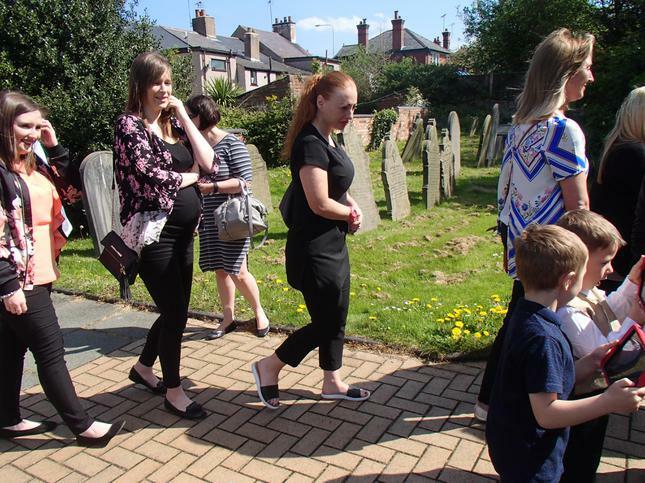 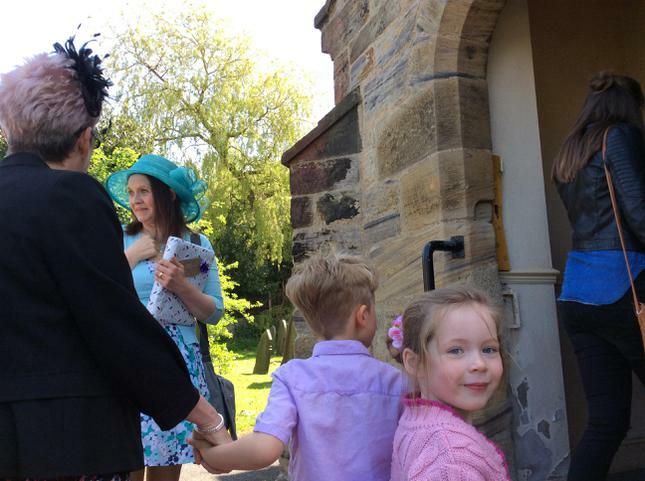 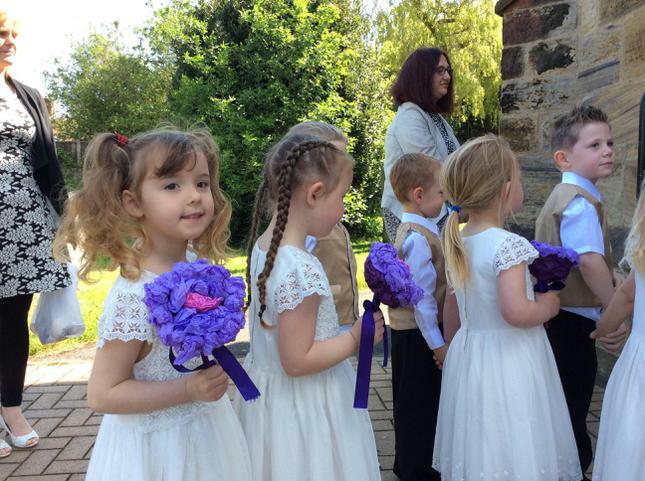 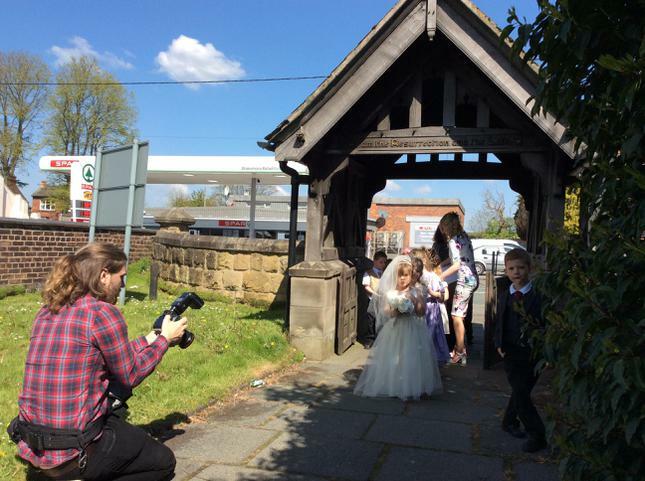 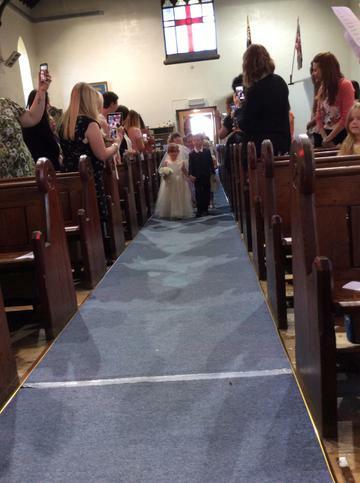 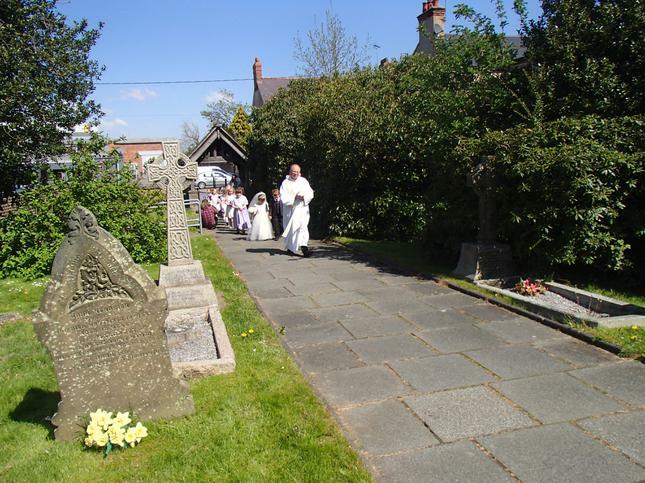 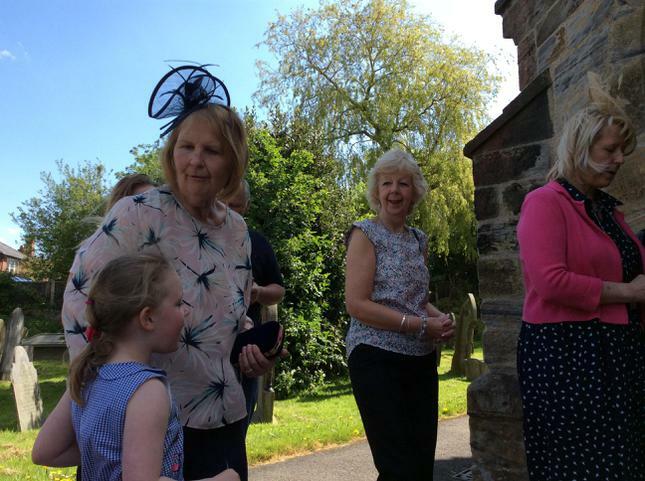 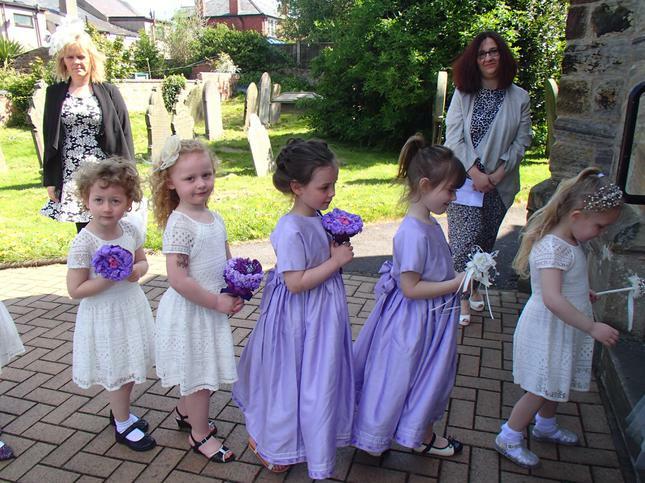 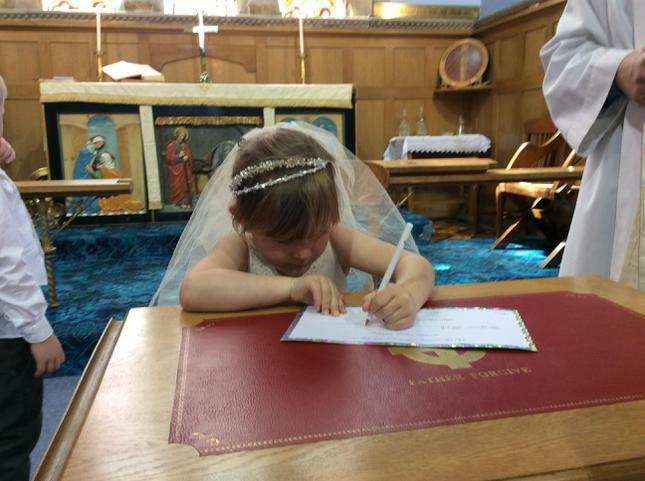 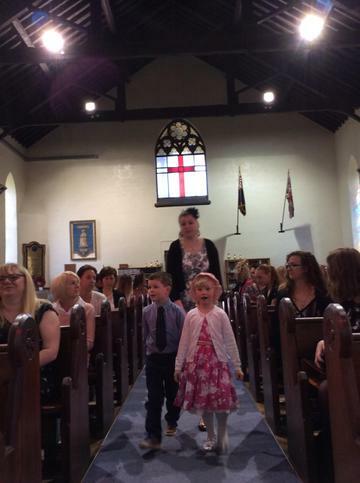 We held the wedding at Bistre Chrurch in Buckley. 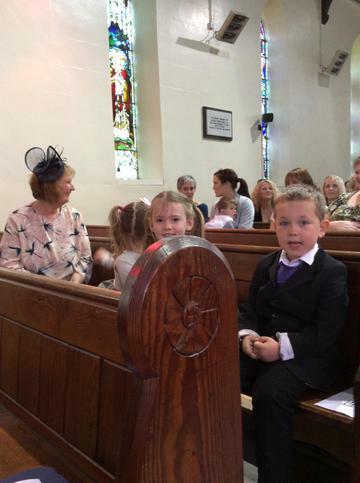 Reverend Batchelor led the service. 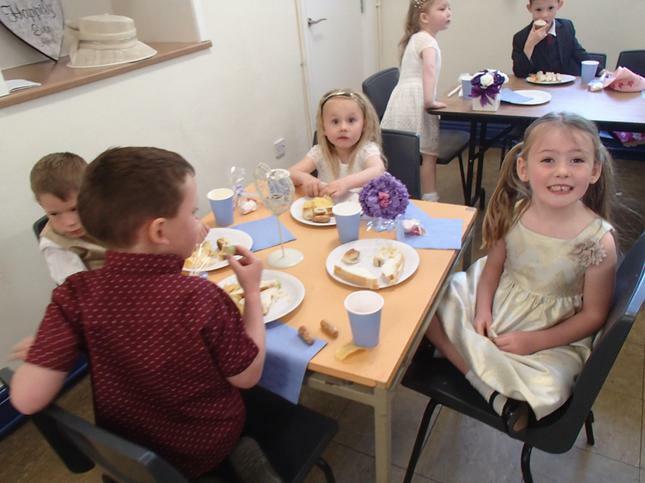 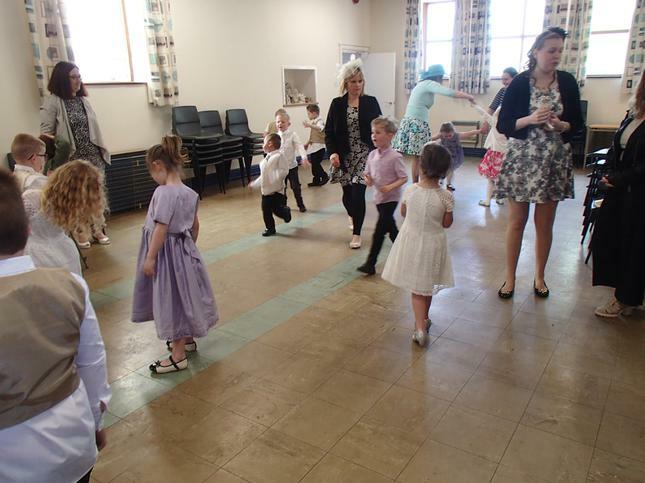 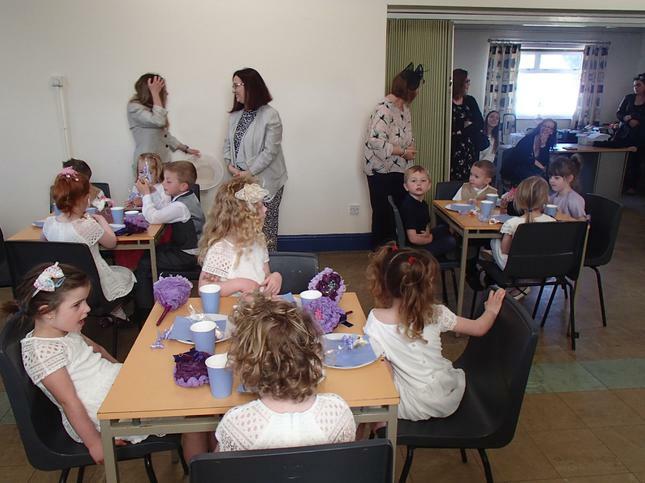 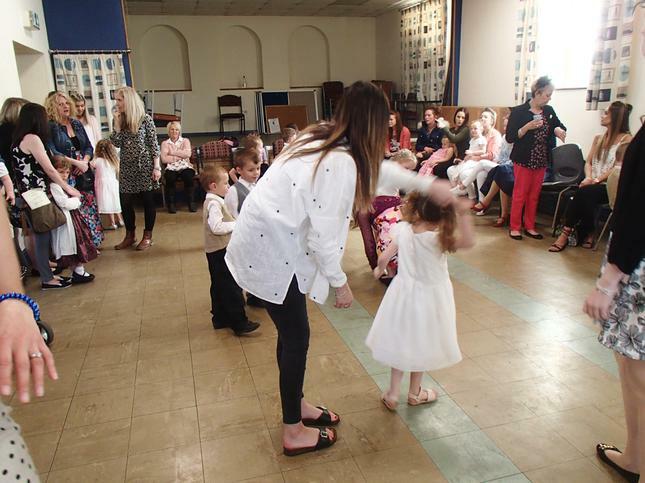 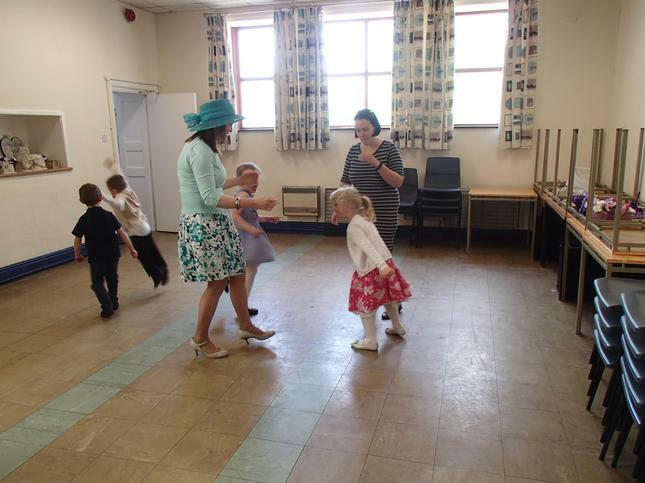 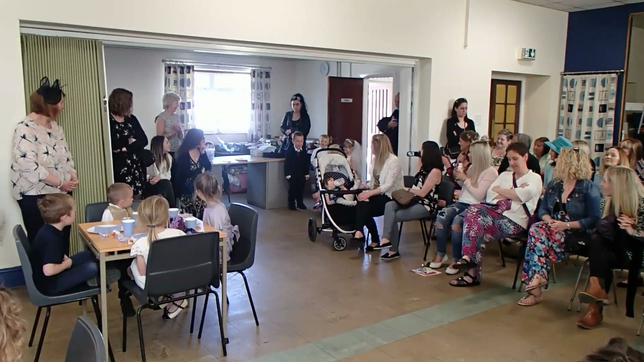 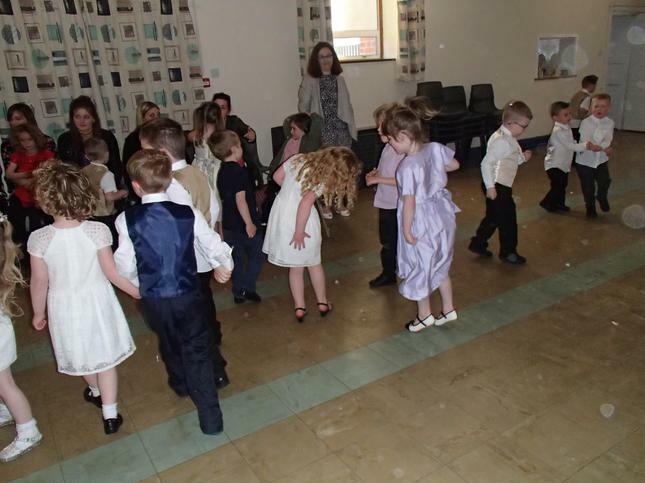 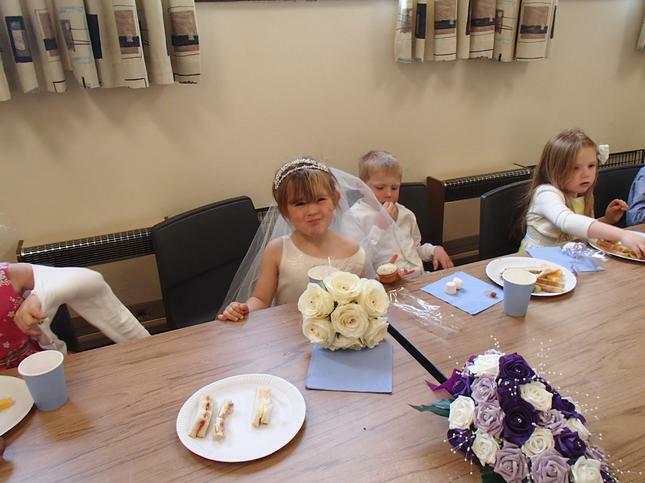 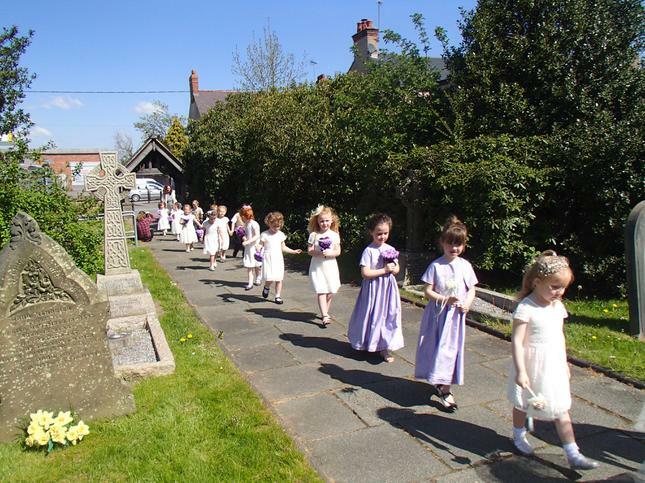 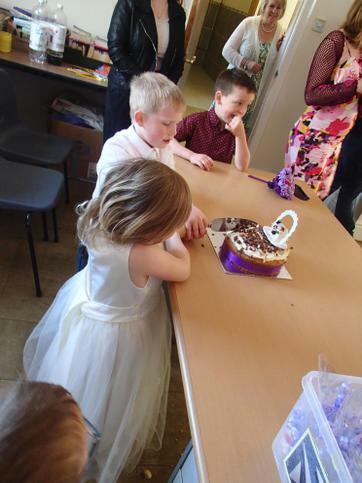 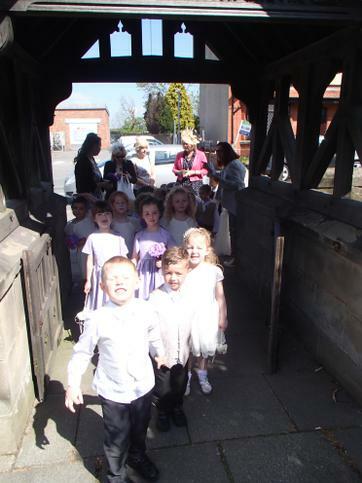 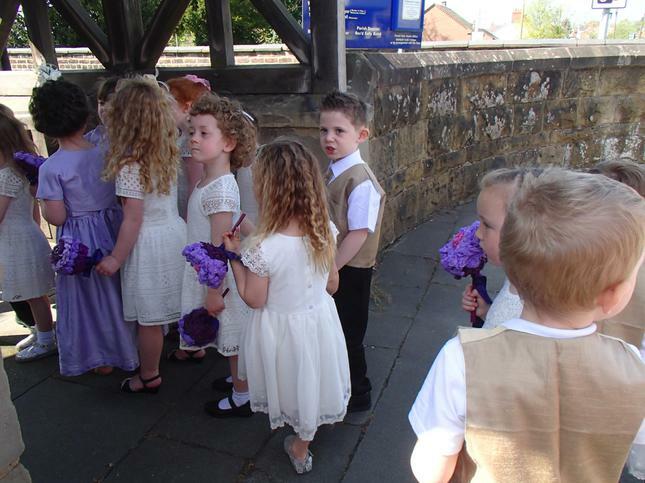 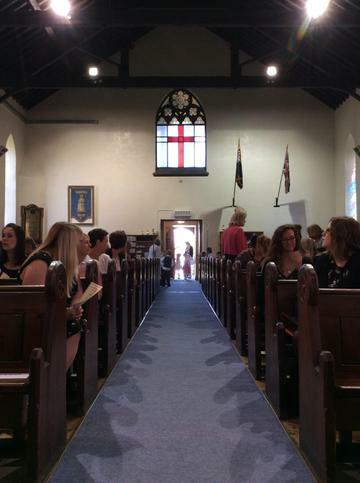 We then went over to the church hall for a wedding reception. 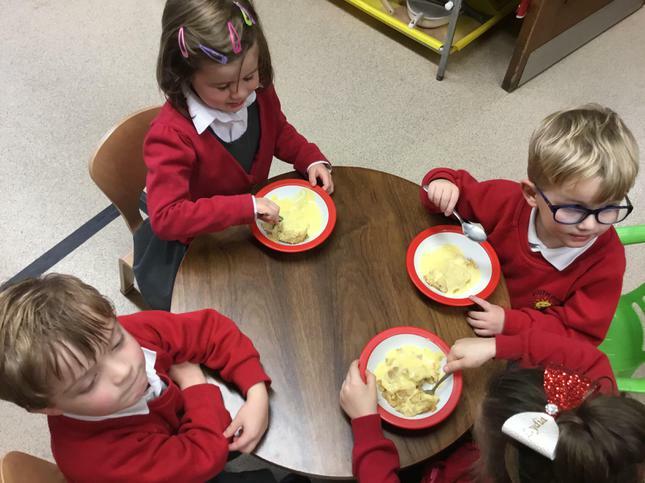 Hwyl a sbri! 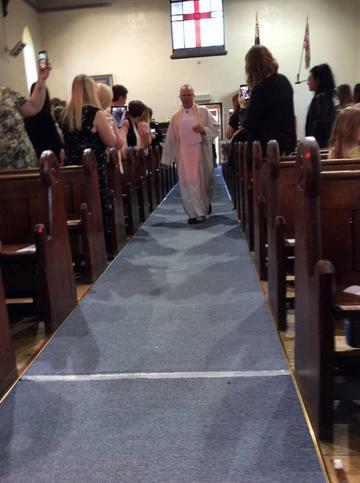 Blasus iawn! 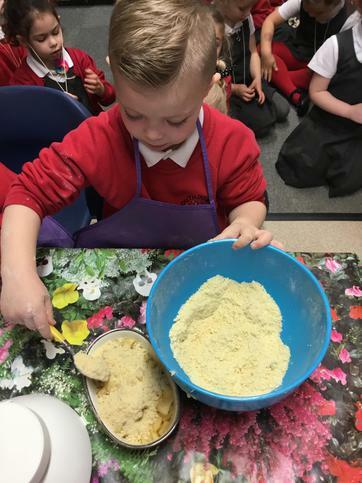 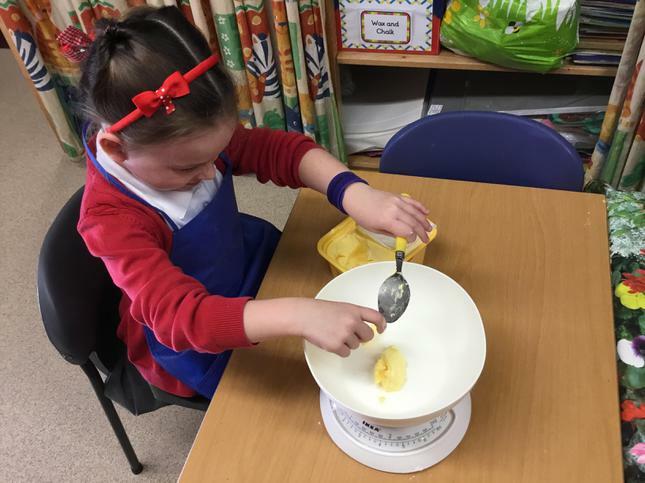 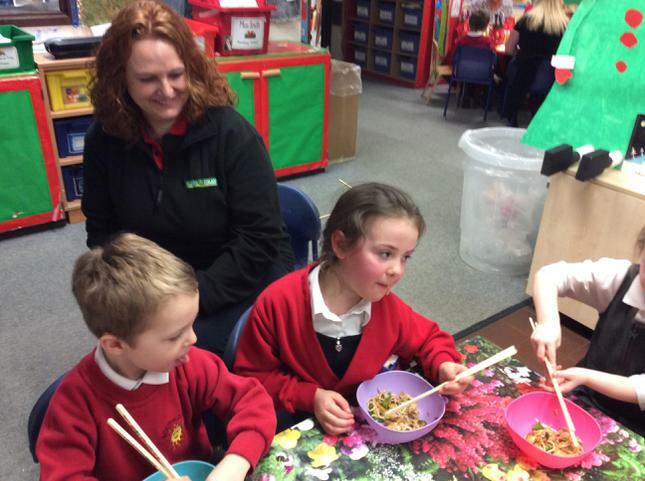 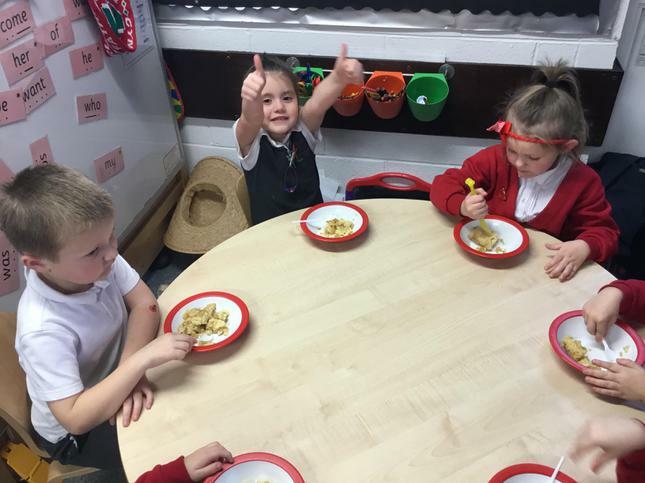 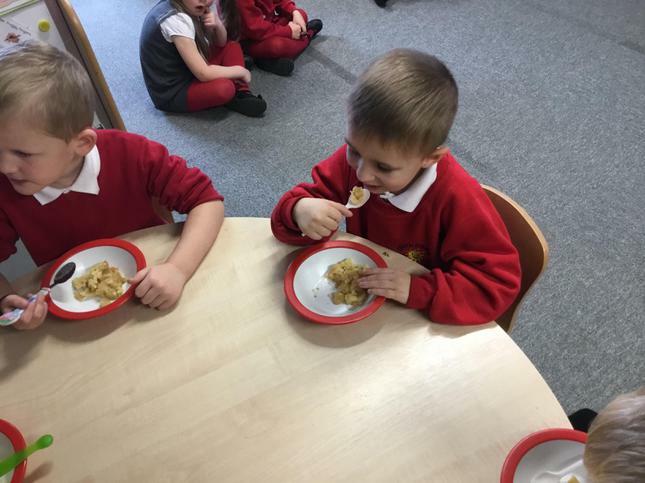 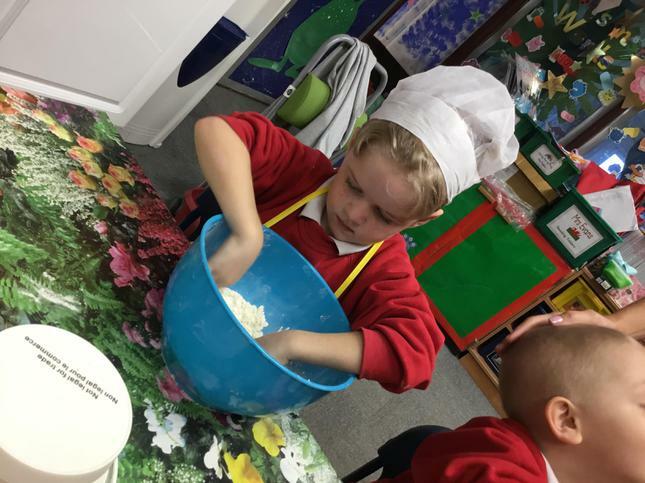 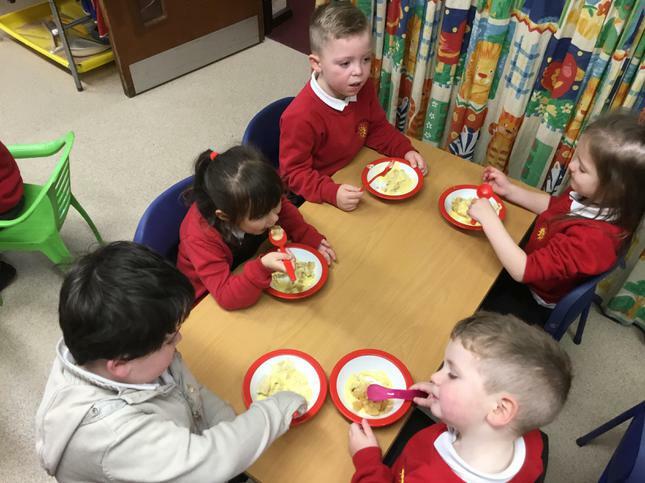 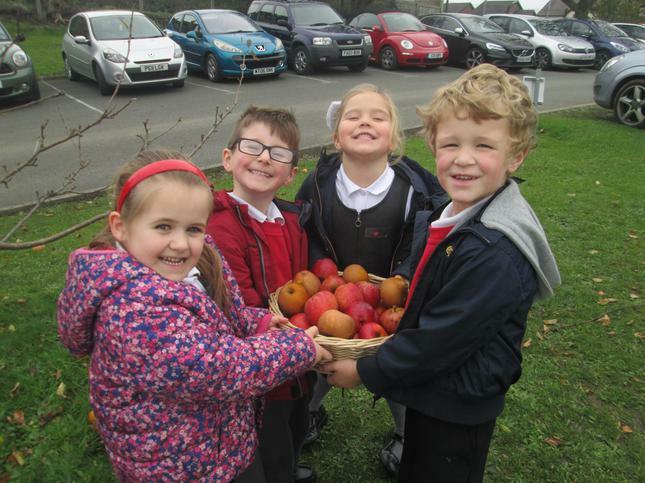 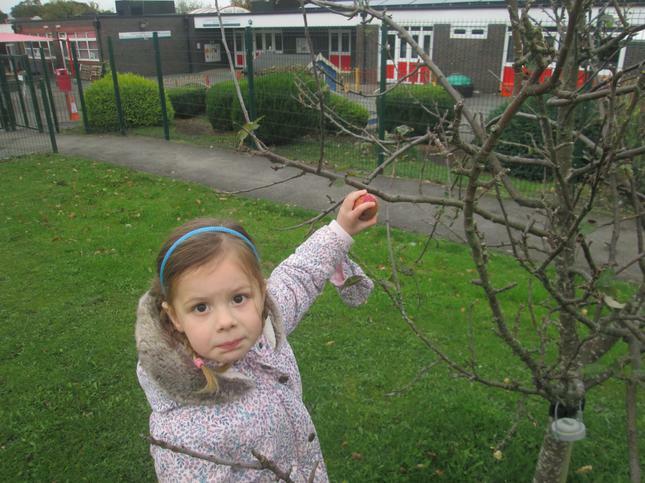 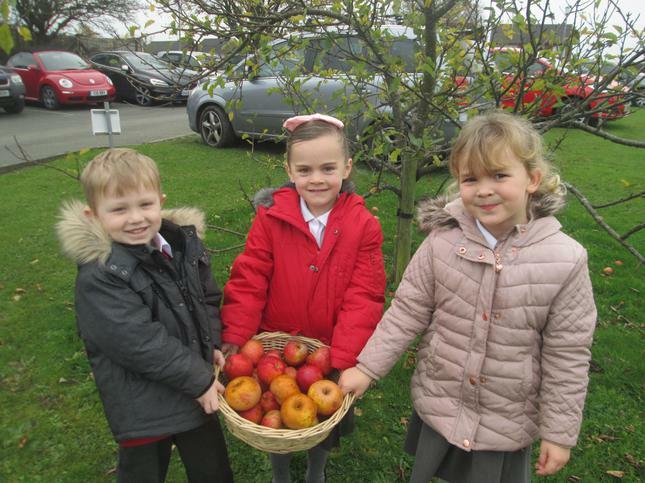 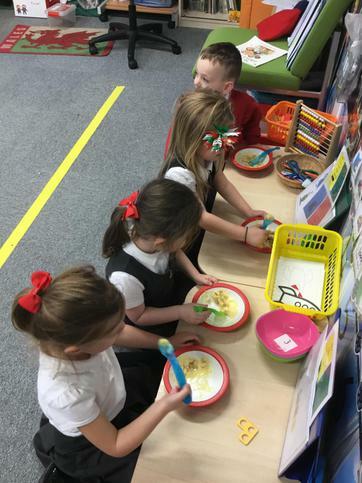 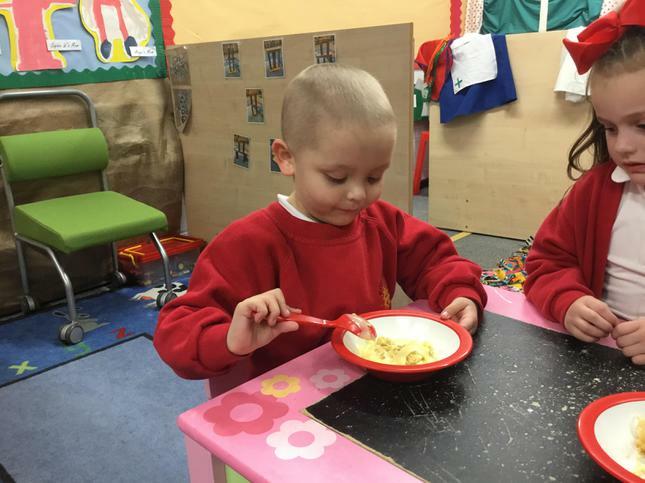 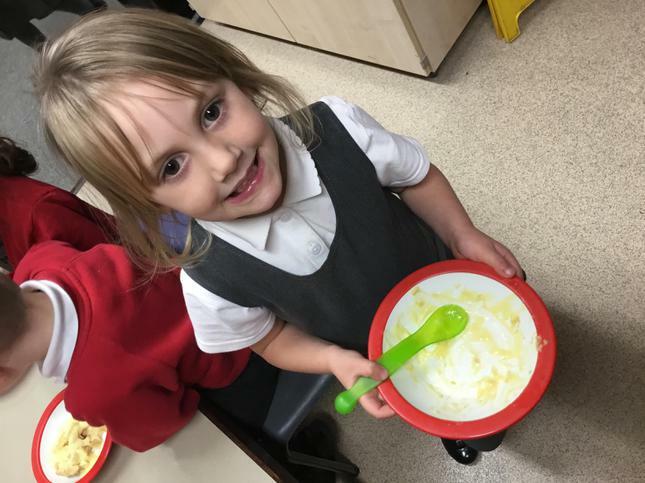 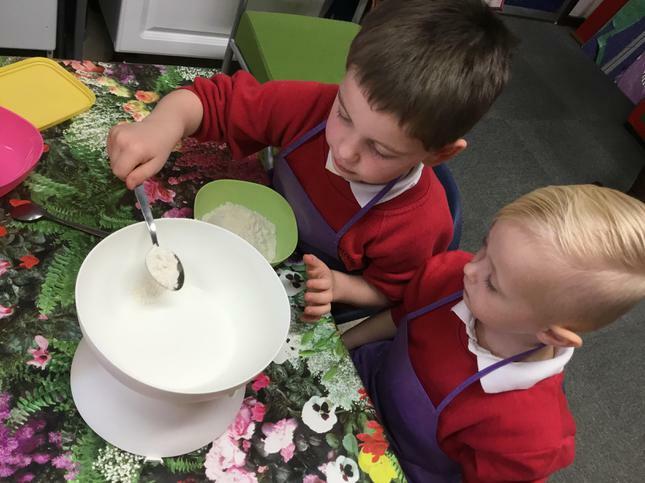 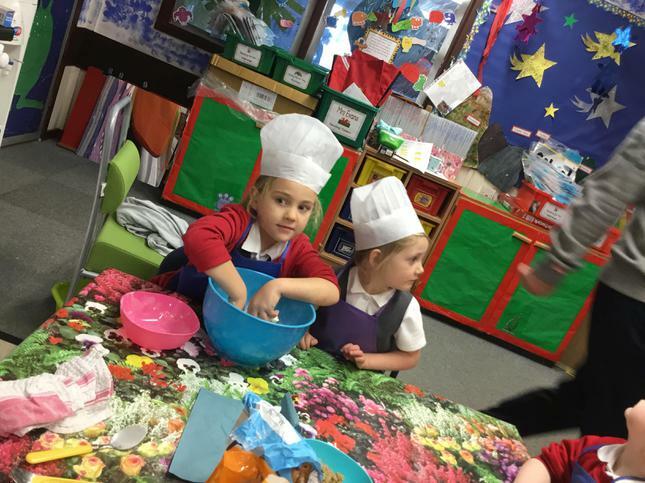 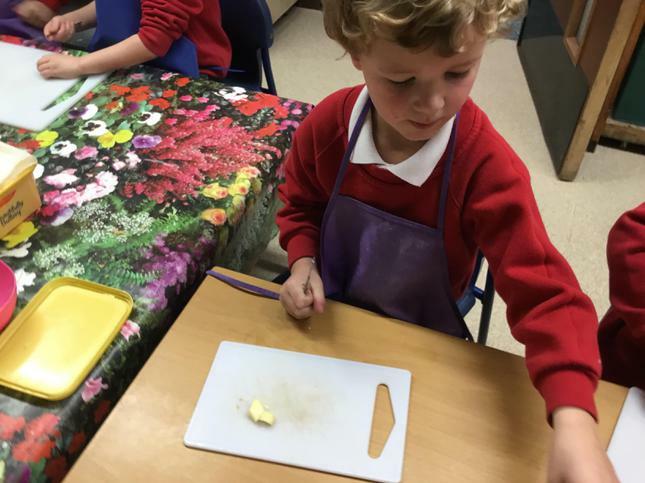 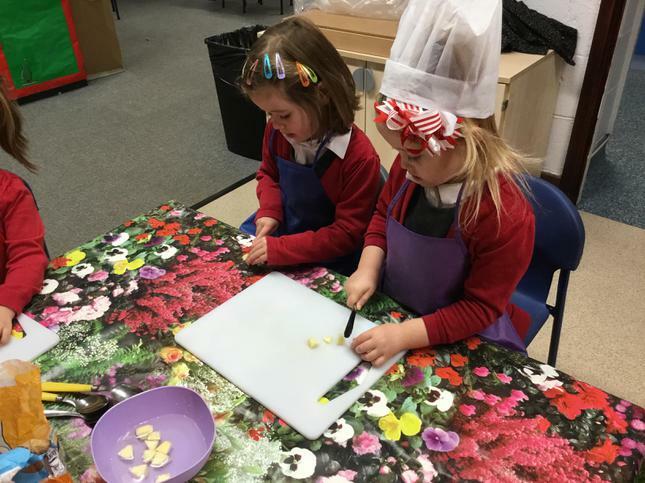 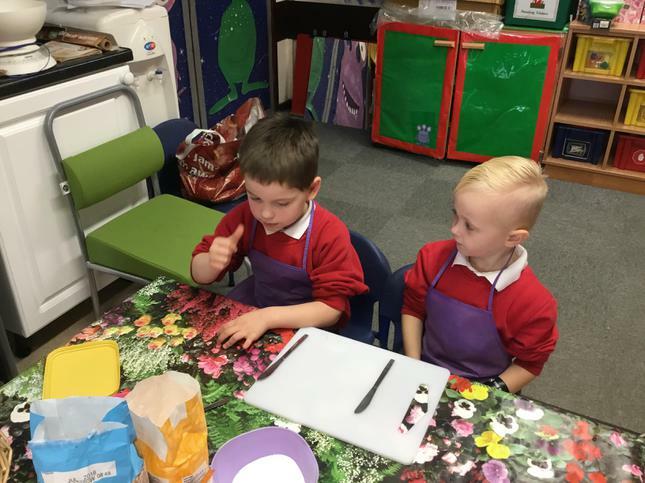 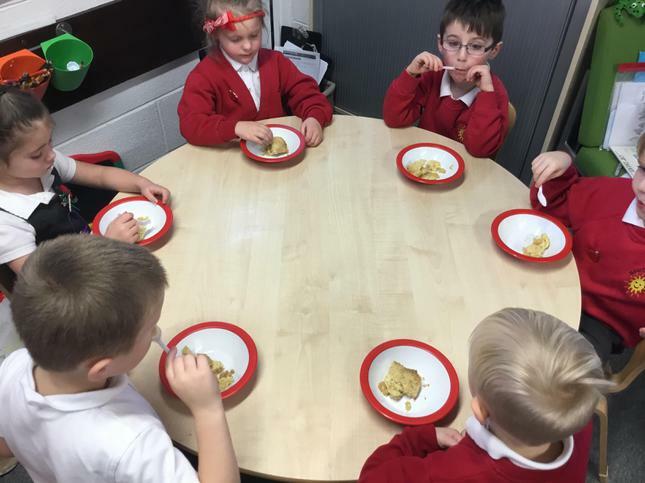 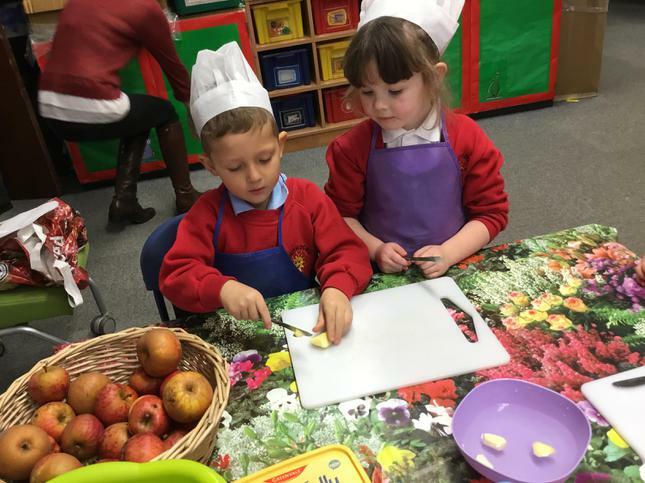 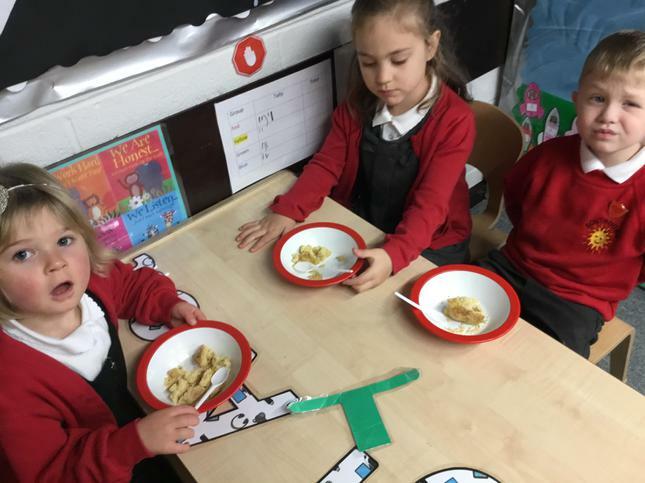 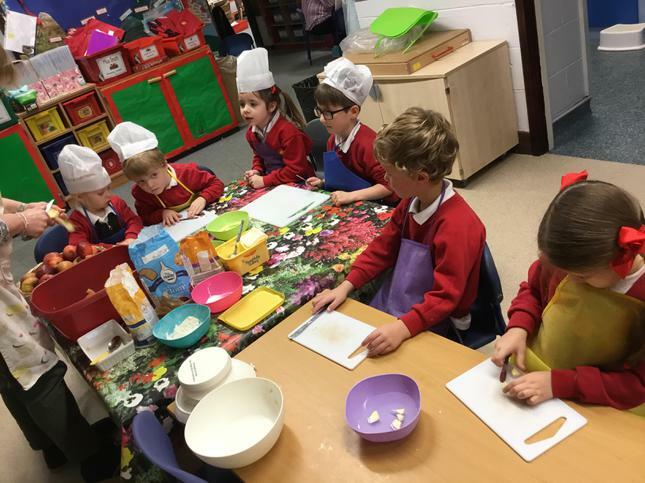 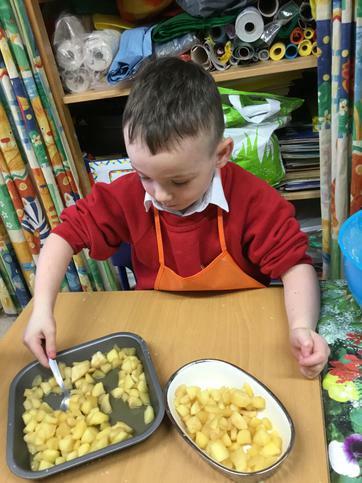 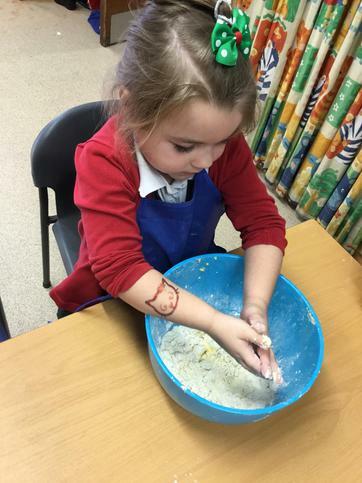 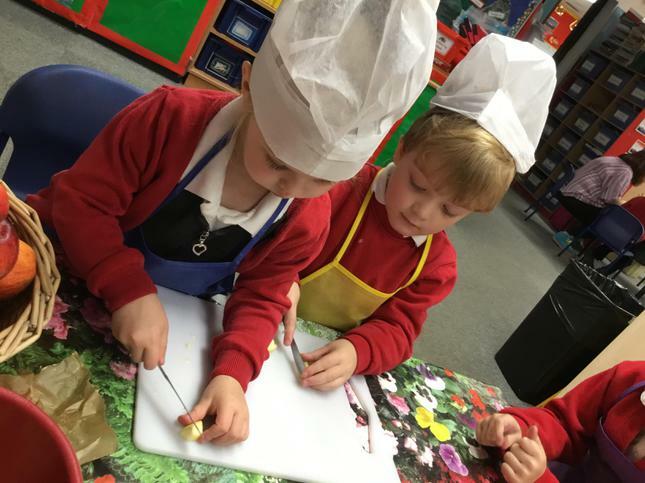 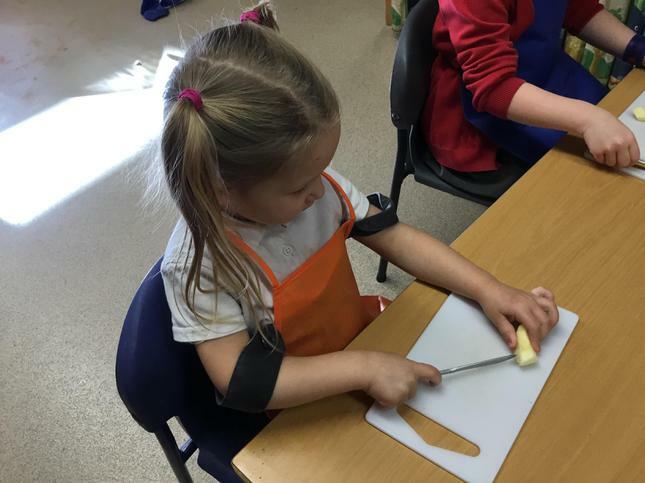 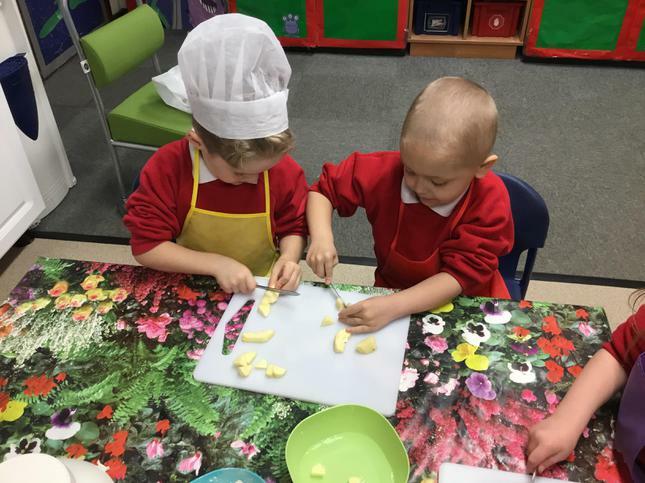 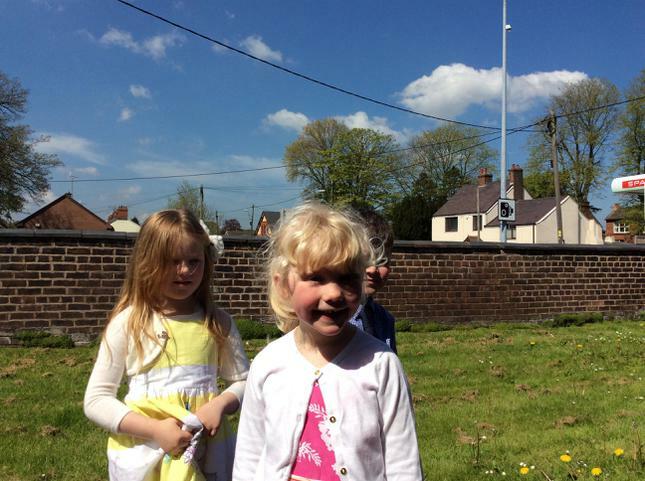 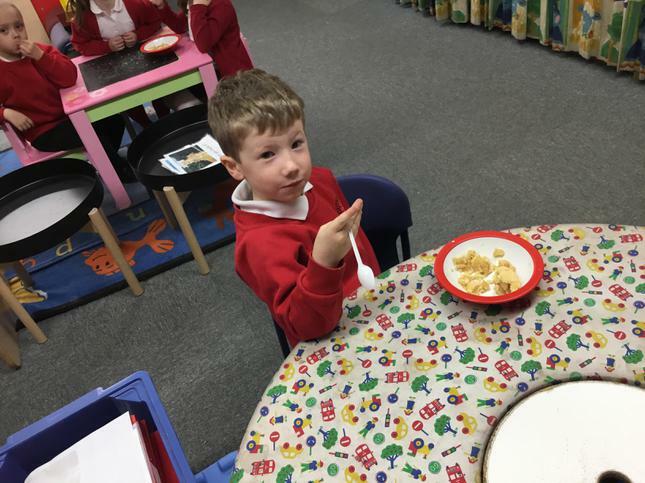 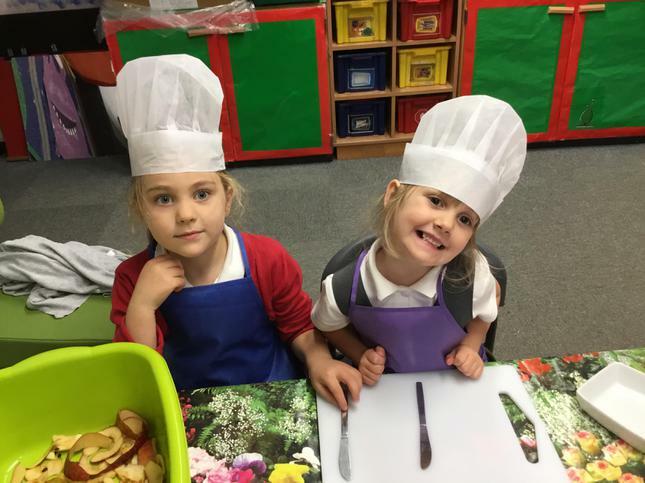 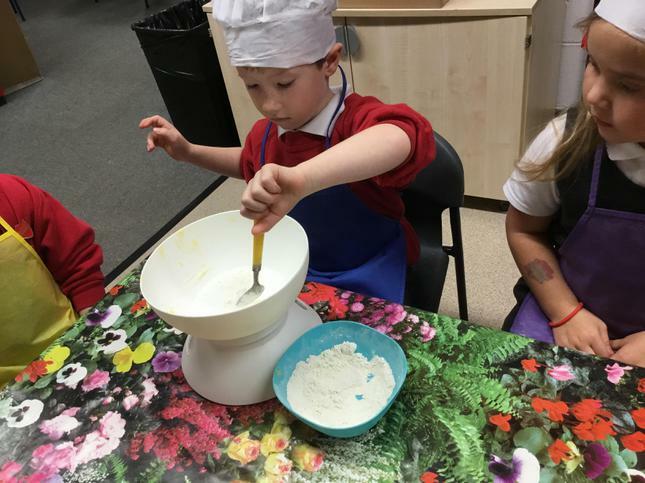 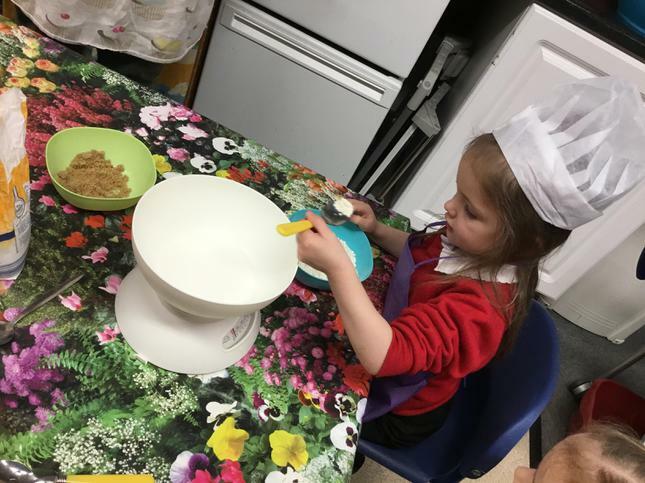 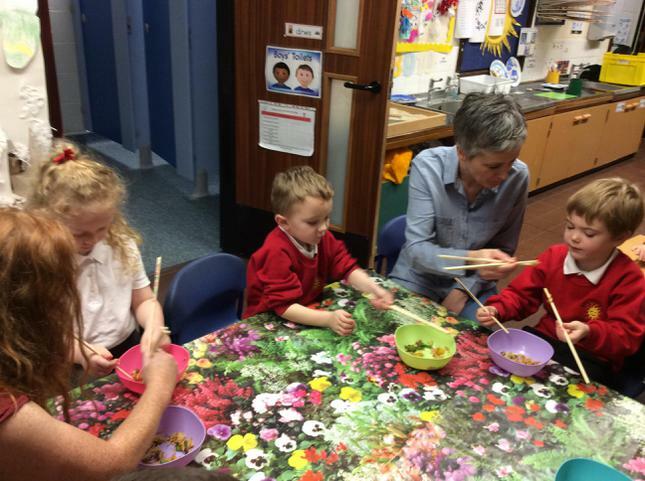 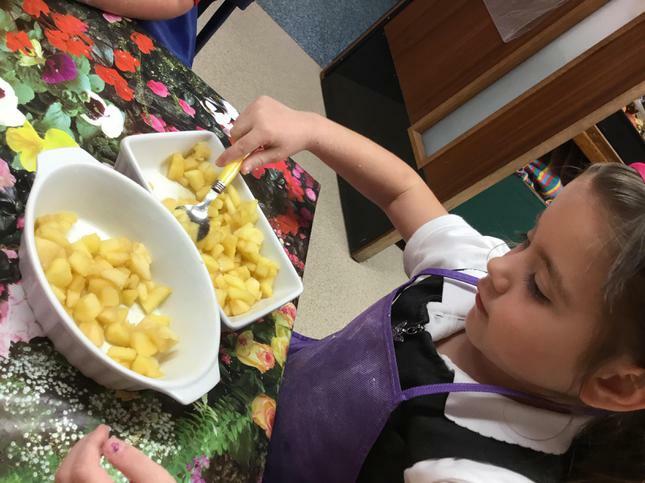 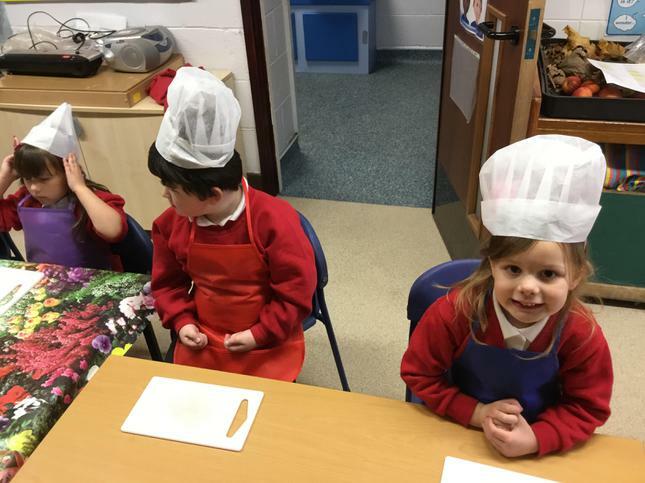 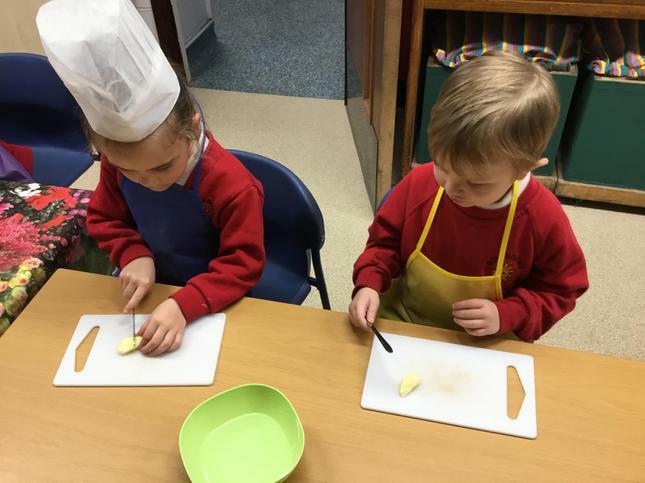 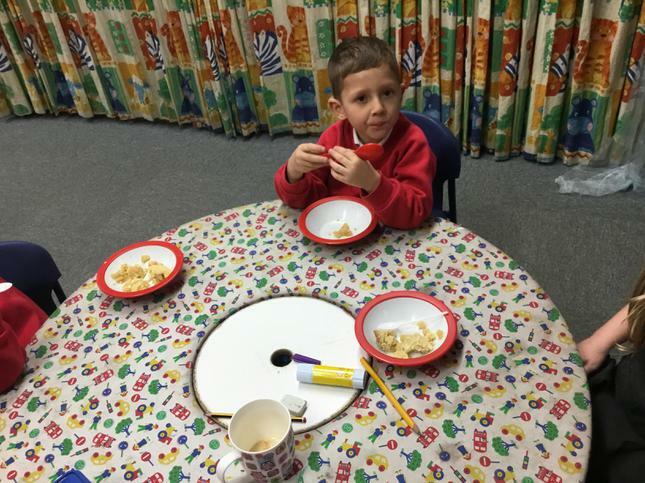 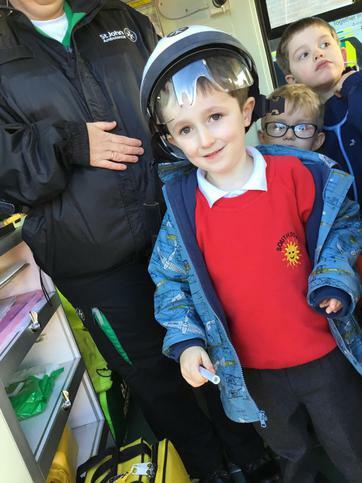 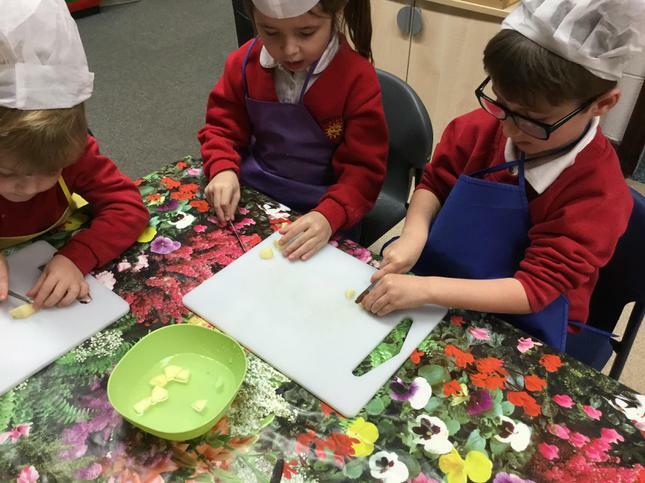 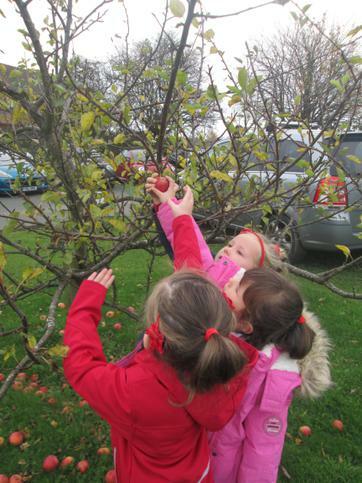 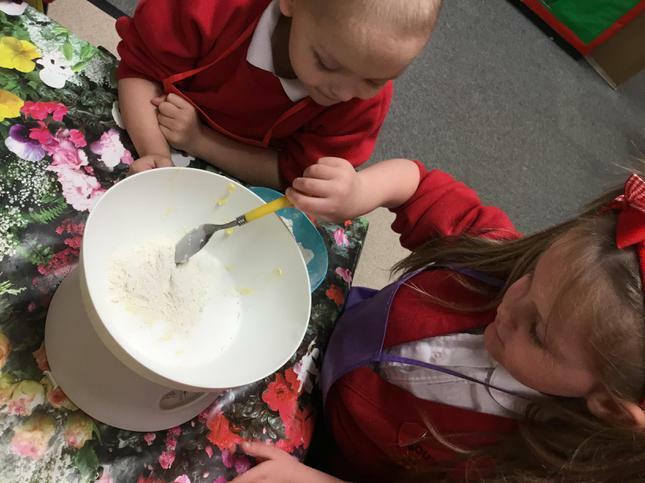 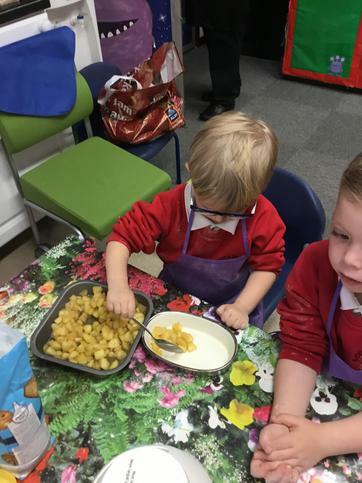 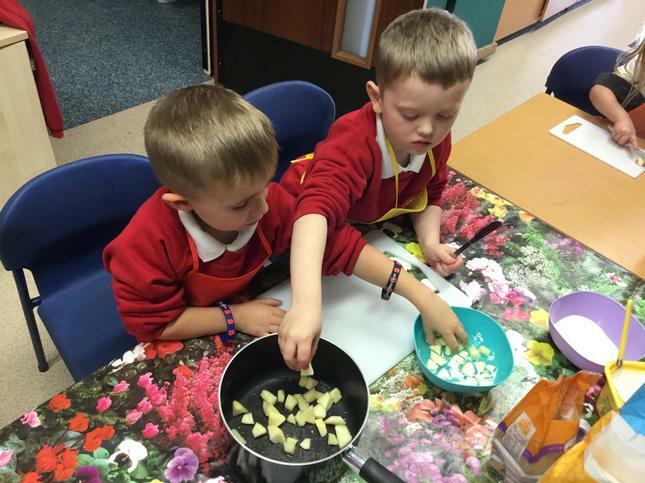 We loved making and eating apple crumble with Mrs Edwards, with apples picked from our very own apple trees!